So much has happened since I last posted. We had a great September and October and I need to catch you up. The first part of September was all about celebration. 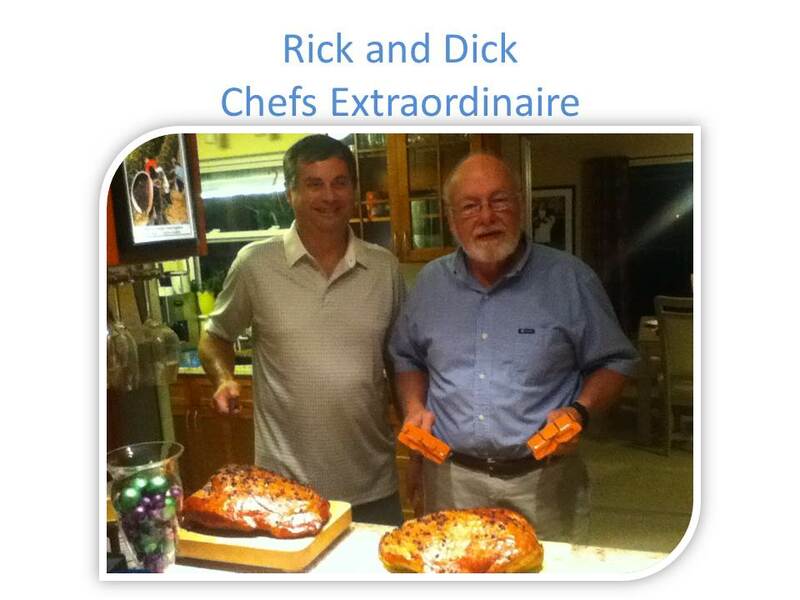 Captain Rick and I celebrated our 44th wedding anniversary AND we had visitors aboard Tension Reliever. 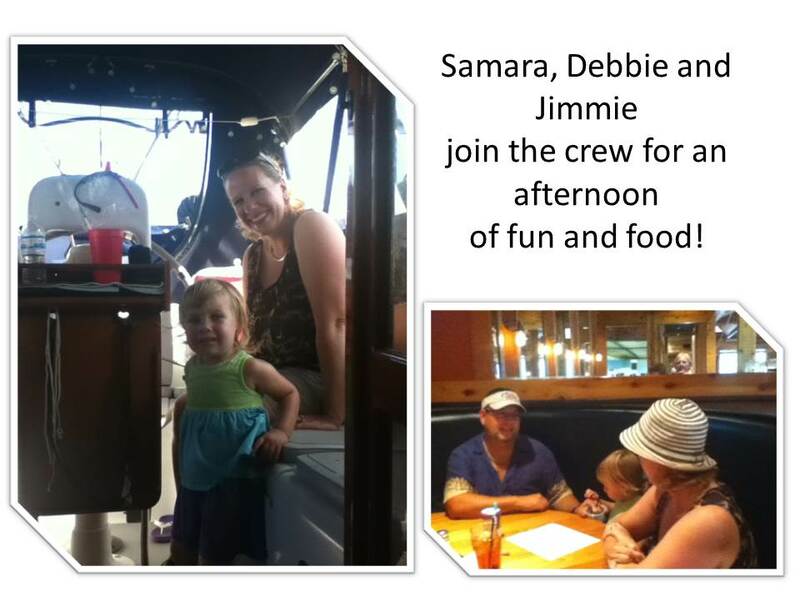 Our son Shawn and his family plus 1 came for a 3 day visit and they opted to stay onboard with us. What a FUNTASTIC time we had. 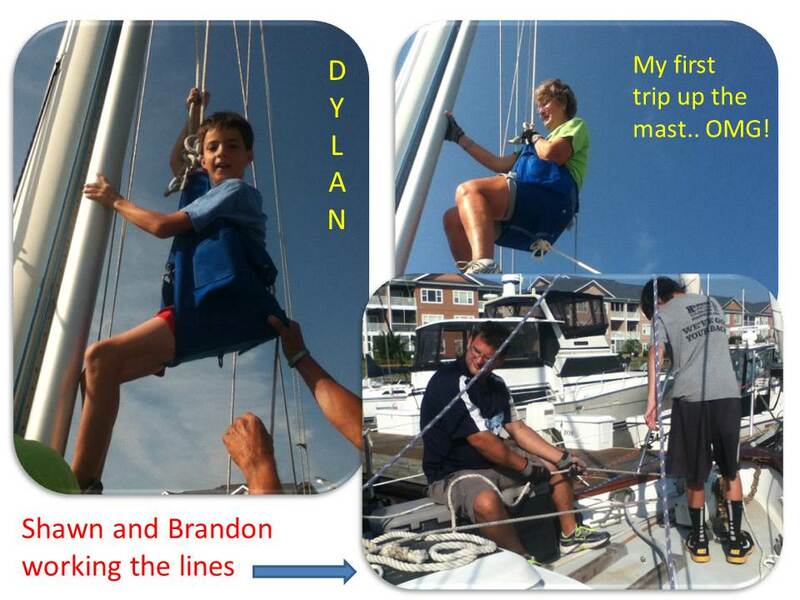 Quarters were a little tight with Shawn, Lori, Maddi, Brandon, Dylan, Trenton and friend Emily aboard but everyone pitched in and made it work! That made a total of 9 adventurers who were up for anything! 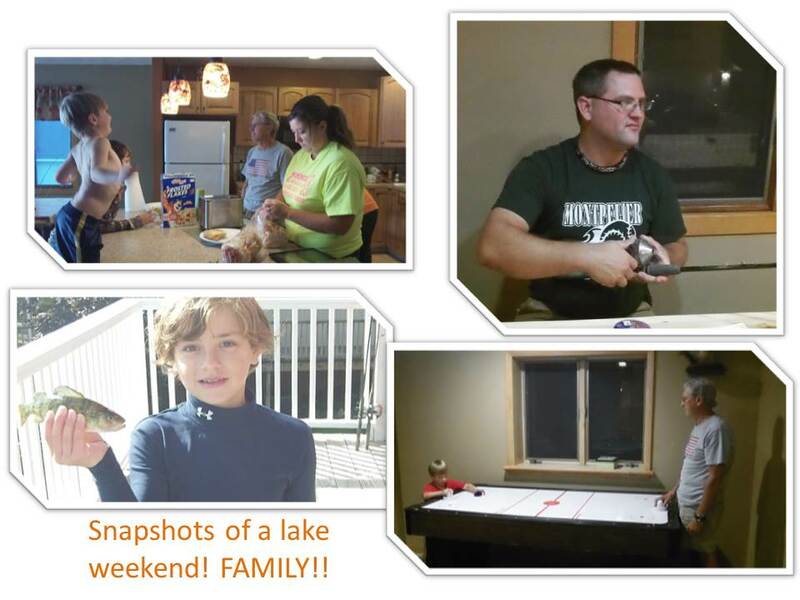 It’s funny how the boat seems to grow when filled with family and laughter. 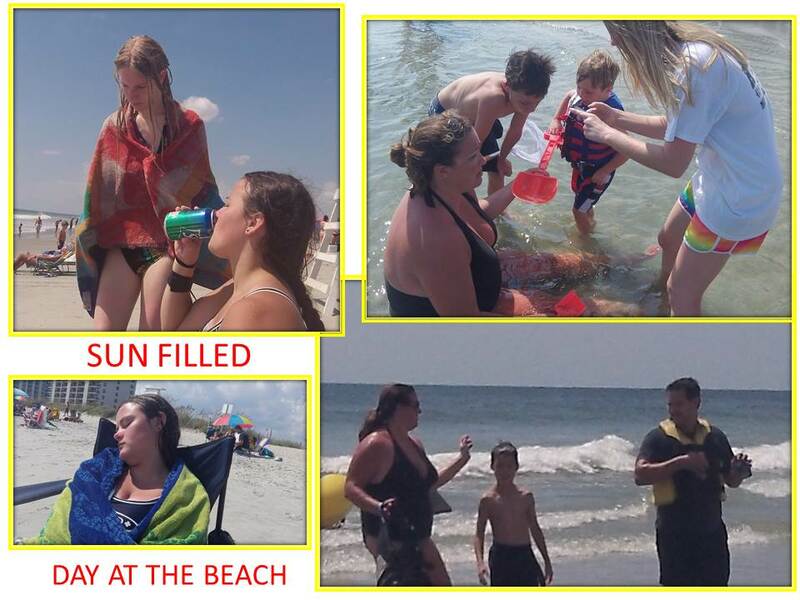 Everyone had a spot for sleeping and days were filled with visits to the beach, parasailing, dinghy rides along the ICW, visits to the lighthouse and a fun day at “Magic Quest” at Broadway at the Beach. Shawn even turned a few cartwheels on the beach to show how happy he was! 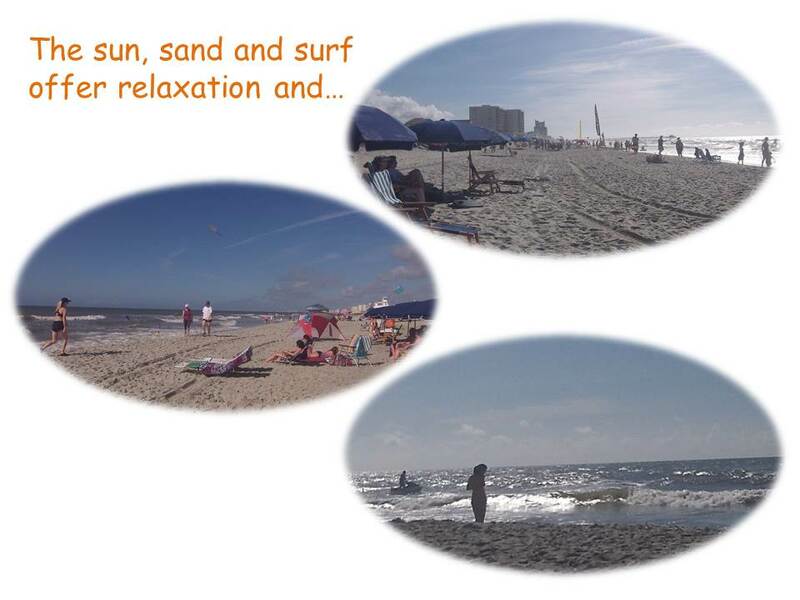 Myrtle Beach has a lot to offer for visitors and we took advantage of a several of them. It was fun catching up and enjoying family time. 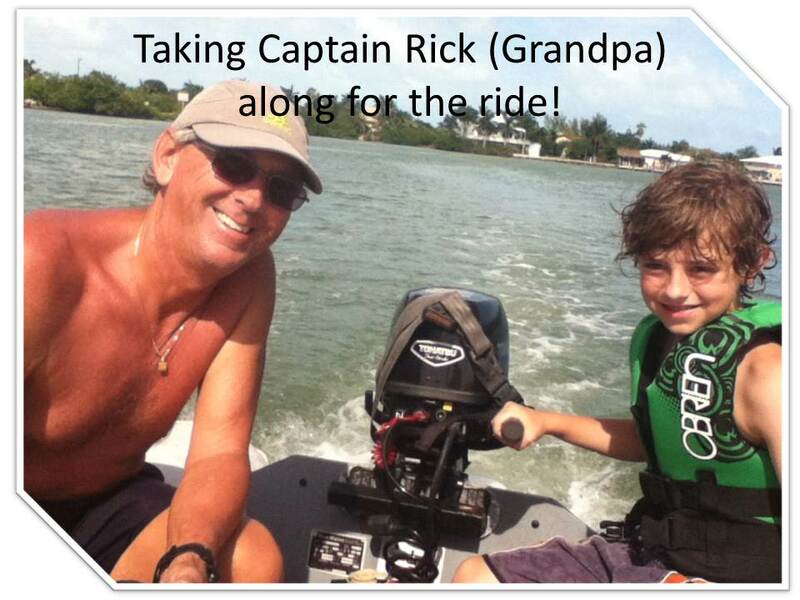 Captain Rick even got some work taken care of. 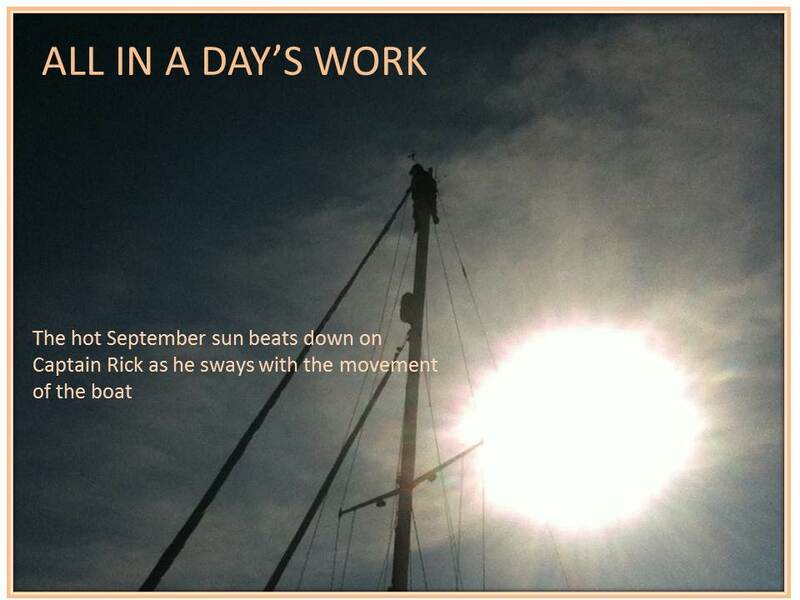 He needed to take another trip up the mast and as we had ready made crew, who were excited to help, the work turned into FUN ALOFT for one and all. 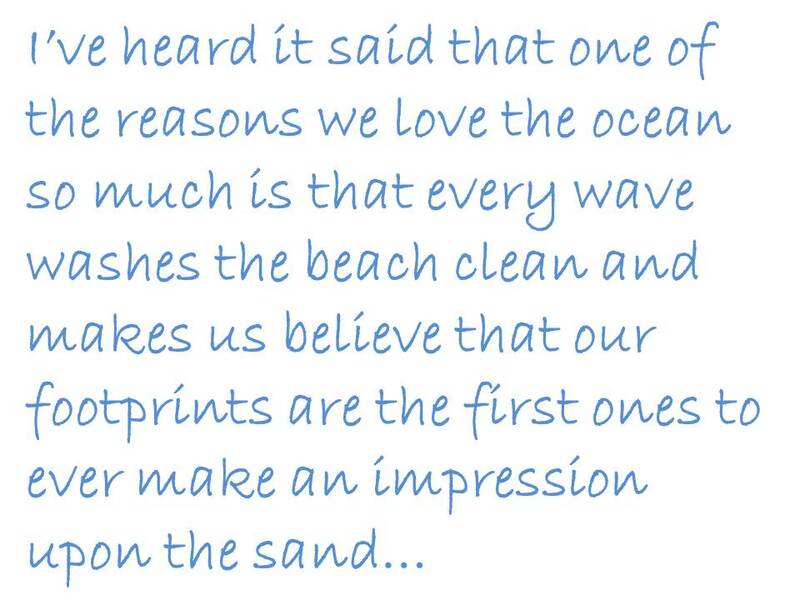 The beach called our names every single day. 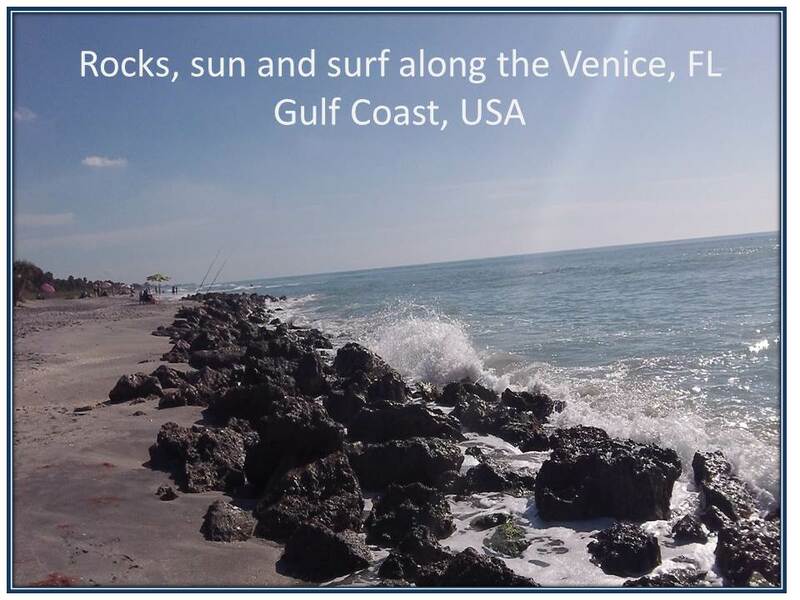 We soaked up the warm rays of the fall sunshine and everyone enjoyed the surf as it rolled in and pounded along the seashore. We couldn’t have asked for better weather and we took full advantage of it from morning till night. The end of September found us traveling to Ohio for a weekend with both boys and their families at a small lake in Michigan. I’m always so awed by how the kids and grandkids let us meld back into their lives as though we’ve never been gone. We spent 3 days of bliss except for my falling down a slippery slope and bruising my foot and ankle. My left foot slipped out from under me and my right foot bent back as I landed on it. Another of those instances where the first thing you do is look to see if anyone saw you and then the pain hits and you hope someone did see you. 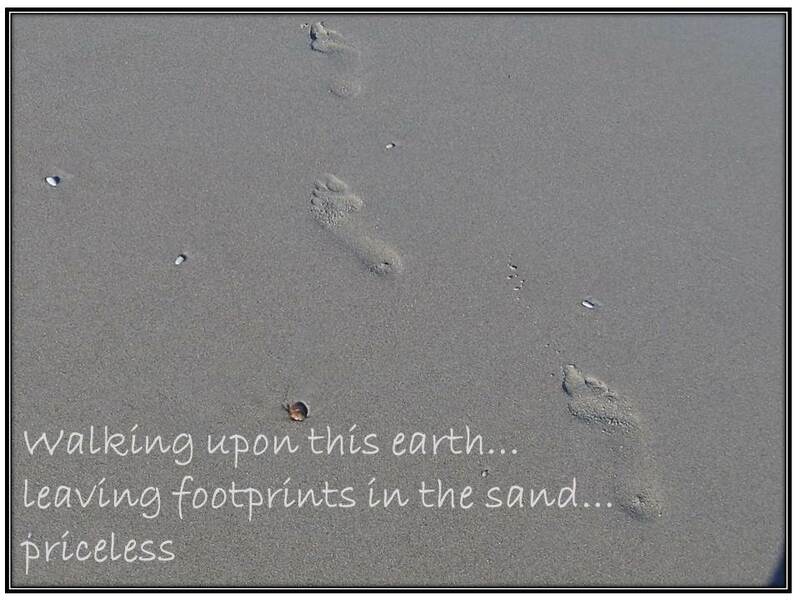 As I lay there wondering if I’d broken my foot, there was no one within shouting distance. So, I picked myself up and limped back up the small slope to the stairs and hopped my way to the top. As I hobbled across the patio, Shawn opened the patio door and asked what was wrong. He immediately took charge, that’s his EMT training, and soon had my foot elevated and ice on it. I moved a little slower the rest of the weekend but that didn’t stop me from enjoying the weekend. 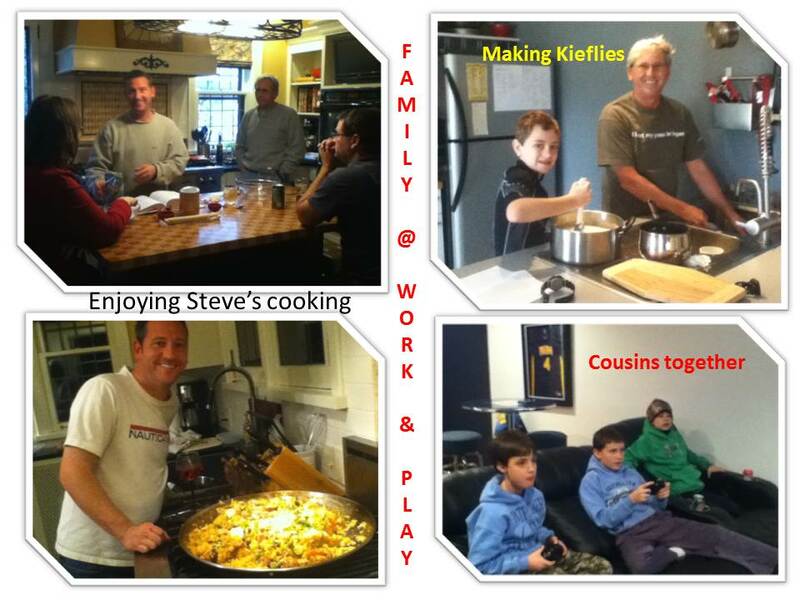 Thanks to Steve, Natalie and Jack for providing us with a great place to play. 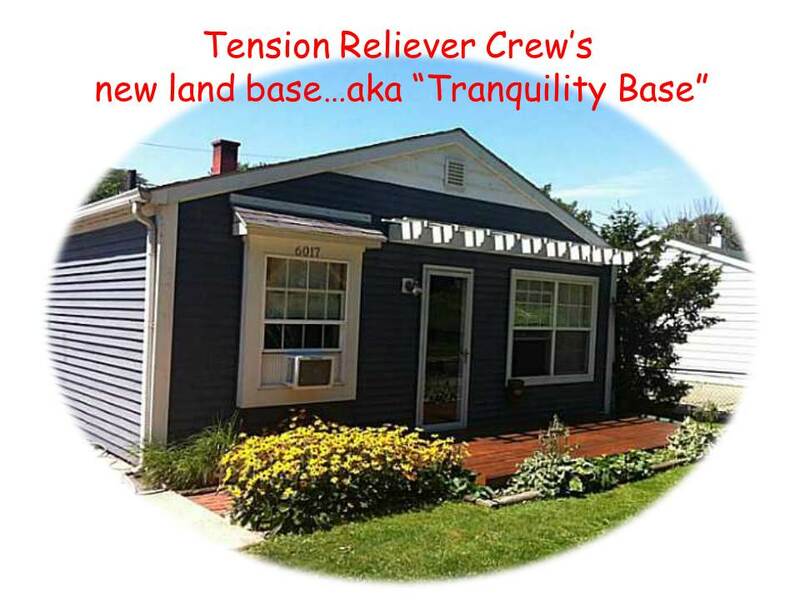 CREW OF TENSION RELIEVER TO TACKLE LIVING ON THE SEA AND LIVING ON LAND! 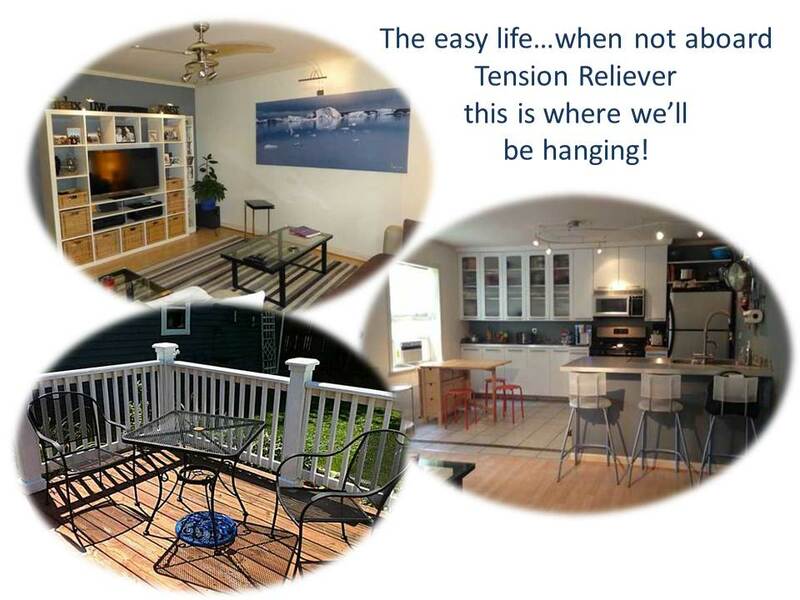 We have had a great time traveling and living aboard our water based home “Tension Reliever”. We have so much left to explore along the east coast of the US and the Bahamas. But our heartstrings pull us homeward. So after having a meeting of all crew members, that would be Captain Rick and me, it was decided we would find a home base close to the kids and spend part of the year with them in Ohio and part of the year sailing into parts unknown. We weren’t sure what we would find when we started our search but as seems to happen so often, fate stepped in and pointed us in the right direction. We looked on line at lots of houses but when we happened on a small blue house nestled along the shore of Lake Erie we couldn’t resist. It’s small, which is just the right size for us, and it will allow us to leave it for months at a time as we sail the ocean blue. We bought it with all the furniture and dishes etc. so it only took about 2 hours for us to move in. Over the next few years, we’ll have fun making it our own a little at a time. This winter we’ll spend some time here to be sure all systems are good to go and we’ll spend our off time at the boat in South Carolina. 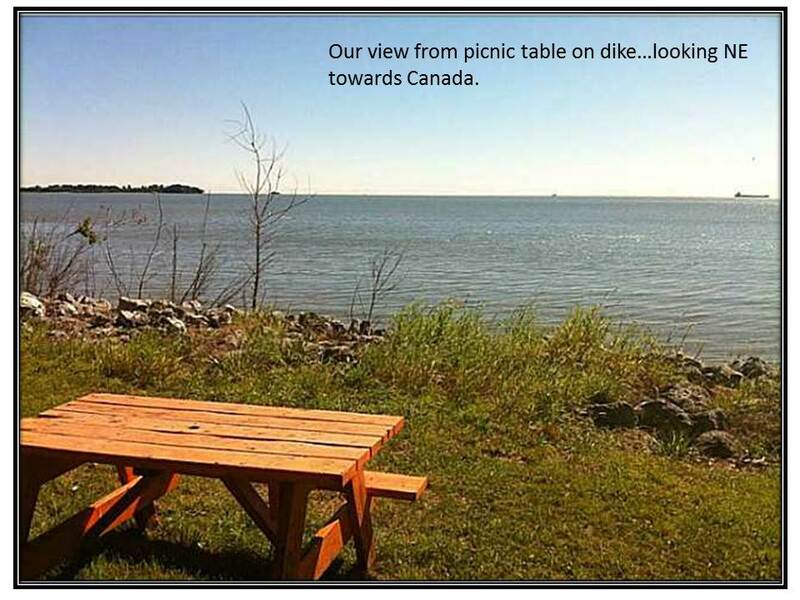 We expect to spend next spring and summer in the Chesapeake and at our new Home Base in Ohio and then next winter will find us heading the boat south to warmer waters. As you can see, we are about as close to the water as we can get. 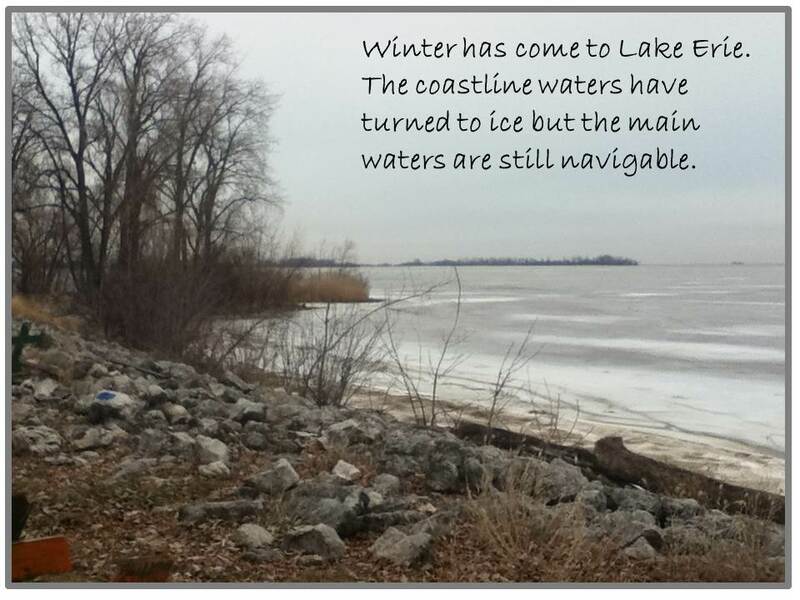 We have to cross our small street and climb a small rise to the top of the dike and then like magic Lake Erie comes into view. As I look out across it’s vast expanse all the way to New York, I know that I could put a boat in the water and make my way all the way to the Atlantic ocean via water. That’s a great feeling!! I’m not sure I could live anywhere again that I can’t see the wide expanse of water before me. Early mornings are magical as the sun comes up over the water. At night, the light from the Toledo Lighthouse shines its path all the way to my shore. Our journey from San Diego has led us to the best of both worlds. A tranquil place by the water,close to our kids and grandkids, and our wandering, traveling home aboard Tension Reliever taking us wherever we choose to roam…truly PRICELESS. 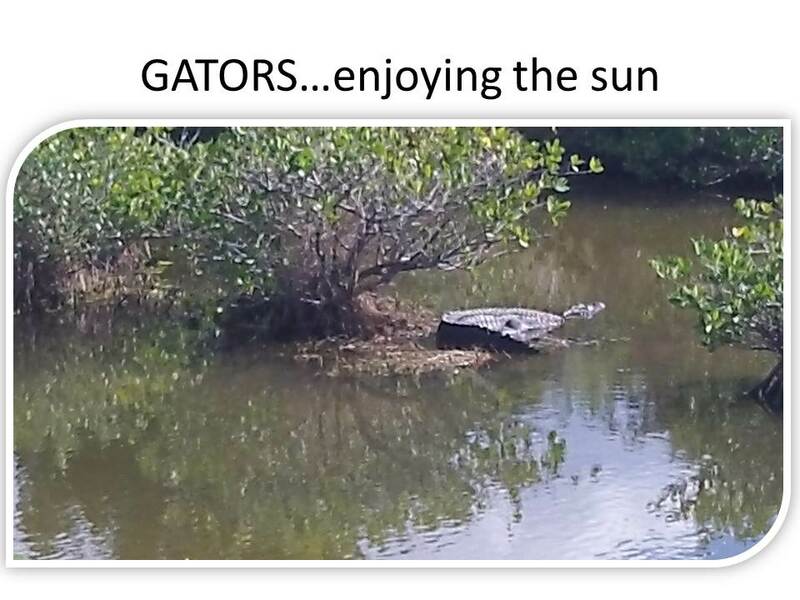 Until my next post…hoping you enjoy your tranquil place in the sun! 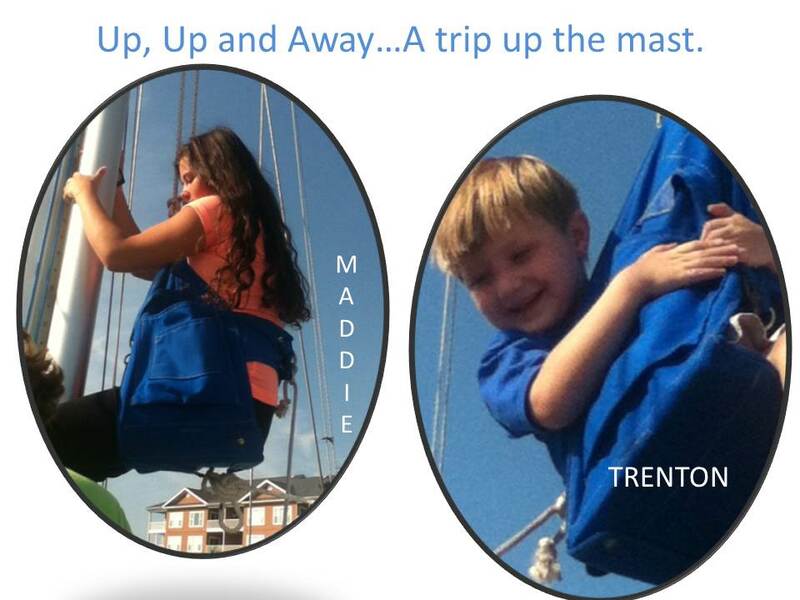 “Sailing takes me away…to so many places and so many experiences. 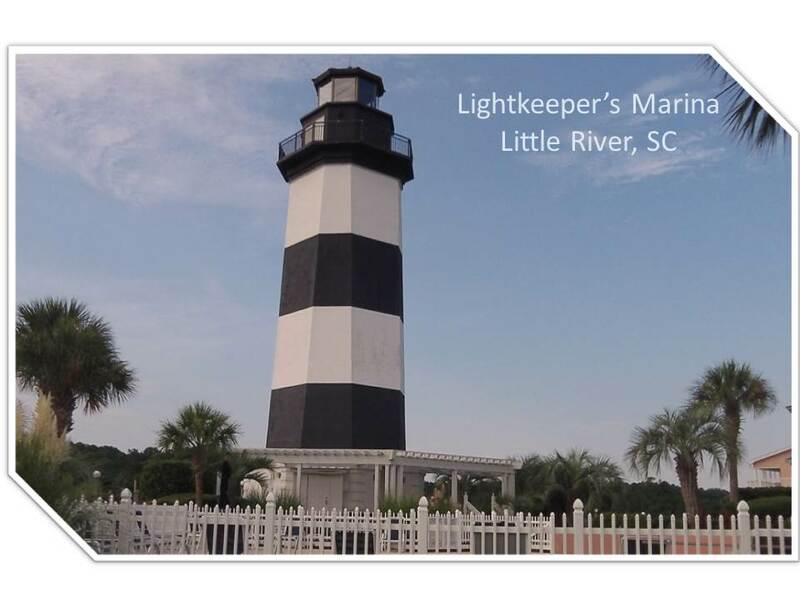 After sailing close to 7,000 nautical miles, we find ourselves in Little River, South Carolina. We’ve been here for a month and have been busy exploring the area. Tension Reliever is docked at Lightkeepers Marina and it comes complete with its own lighthouse. 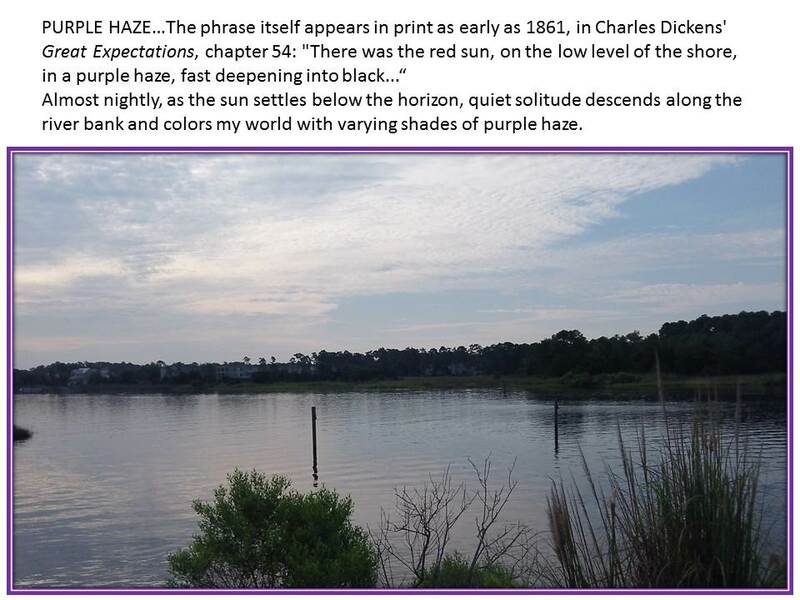 A boardwalk surrounds the entire harbor and leads past the lighthouse and along the Intracoastal Waterway. 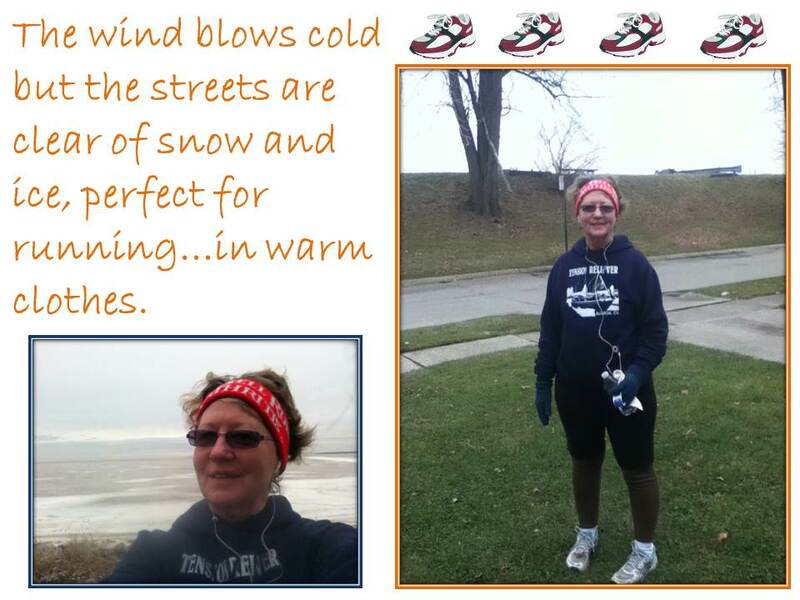 A walk around the entire harbor is a mile and a half and makes a great place to walk or run. I think the best time to walk to the lighthouse is either early, early morning or in the evening just as the sun is getting ready to settle below the horizon. The rising or setting sun adds such glorious dimensions to the air and the space along the river that it makes you want to stop and soak up the all-encompassing beauty and fill your lungs with not only the cooler, crisp air but to also pull the vast array of mellow colors deep into your soul. It works for me every time!! 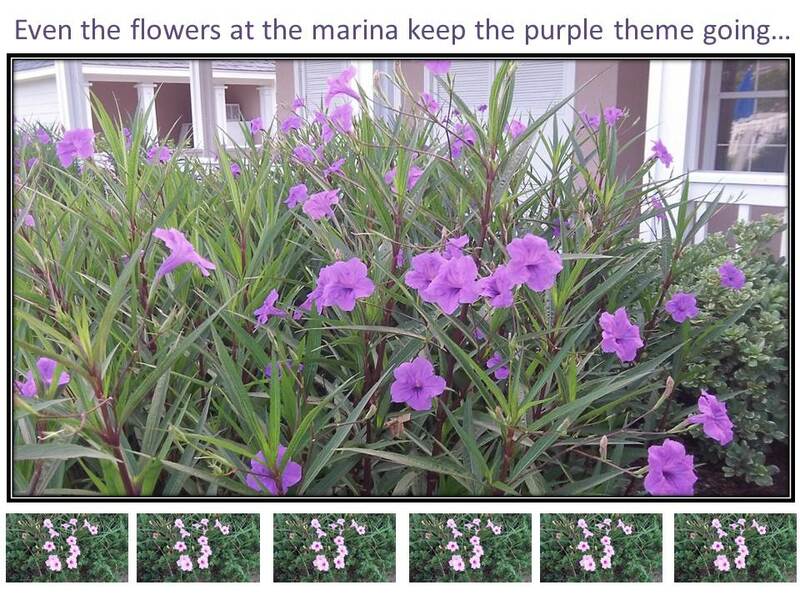 The marina itself is quiet and adds to the tranquility that you find along the walkways. The staff has been fabulous and James, the manager, knows all and is more that willing to share. He’s been a great asset and a true southern gentleman. Even with all the work we’ve done, we’ve still found time to explore and of course visit the beach. The water isn’t the color of the Caribbean but its clean and wet and cool and comes rolling in wave after wave. 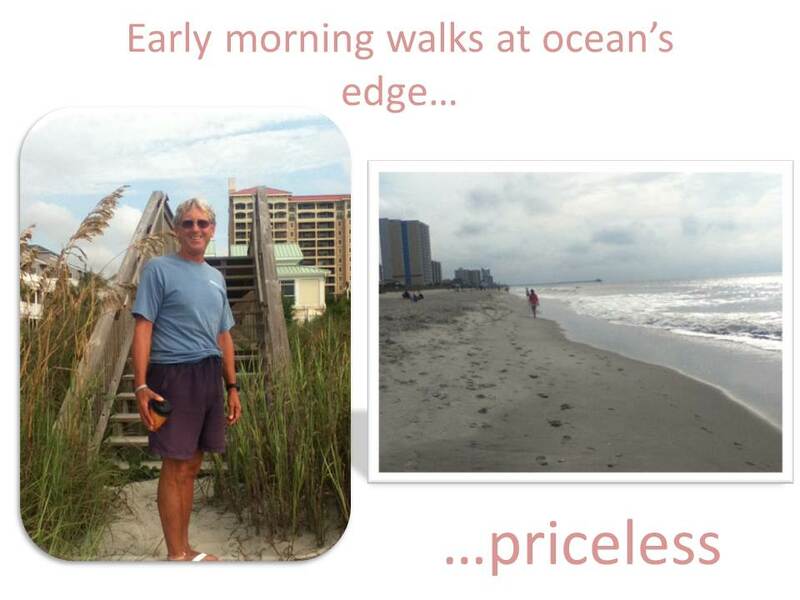 It’s amazing how a trip to the ocean can calm and refresh your frazzled work a day nerves. 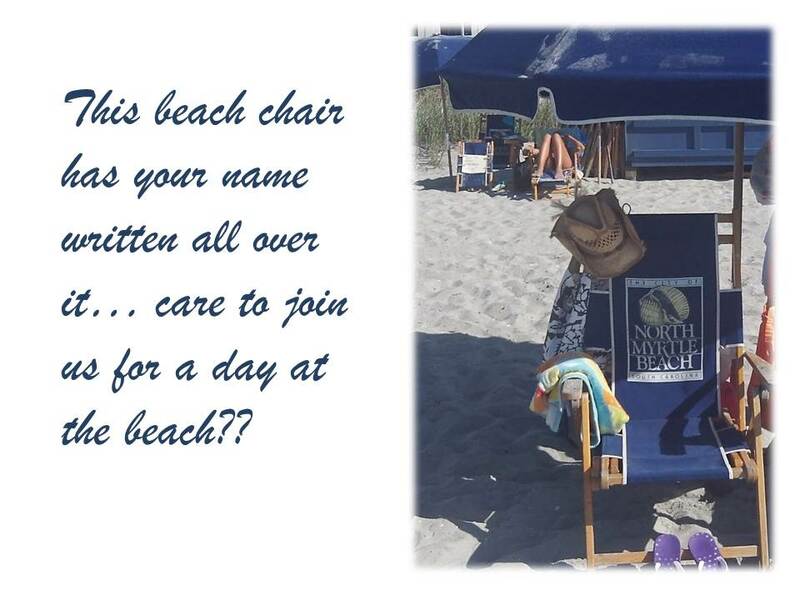 We’ll be here awhile, so if any of you are interested in pulling up a beach chair and visiting, let us know. We’ve been walking our butts off. A couple of days we have logged over 10 to 12 miles. 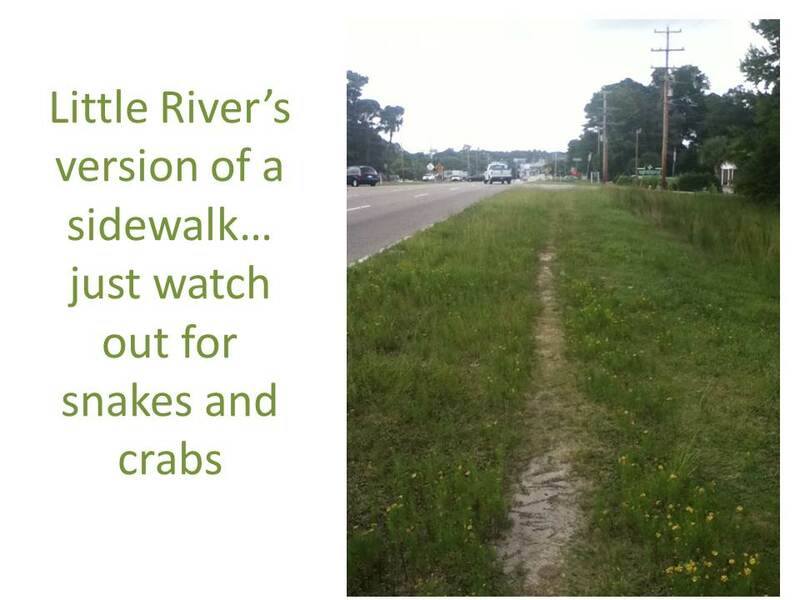 A lot of it has been along the sides of the road with no help from a sidewalk. There is sometimes a well-worn path to walk along but one day we had to walk through thigh high grass and weeds. I can tell you I was definitely on snake patrol that day. We walked to Vereen Gardens which is on the South and North Carolina border. Pictures on that will follow on the next blog. Of course, all our walking has been done in the month of August. We’re hoping with the upcoming fall we’ll find some cooler weather to explore and maybe go further inland and try some mountain walking. We have been visited by family. My sister-in-law’s sister and her family live near here and they came over for a visit. It was so great meeting new family and talking about all the people we have in common. Samara, who’s 2 1/2, liked being on a boat until…well, she was playing with her little wheeled camper on the floor of the cockpit. It was small like a hot wheel car and she had it zooming all over. She shoved it towards the back of the boat and it went roaring along the cockpit floor. All of a sudden, the noise of its wheels stopped and it vanished into thin air. The look on her face was unbelievable. Her eyes were as big as saucers and her mouth formed a perfect circle. She looked at her mom and then her dad and then me but she didn’t say a word. Her toy had simple vanished off the face of the earth. My bad, I hadn’t thought to cover the cockpit drains and her camper had literally zoomed into the deep blue sea. Her mom and dad made it all better but I’m not sure she was as tickled with a boat as she was at the beginning of her visit. 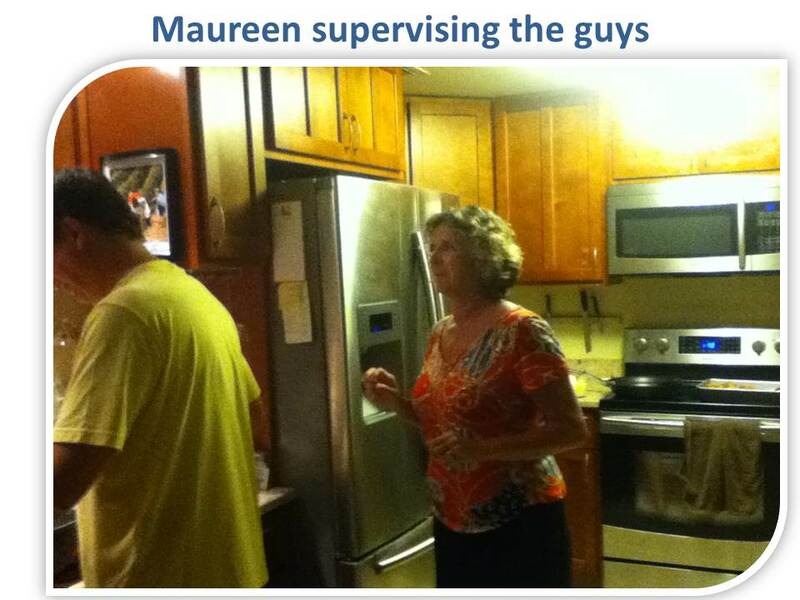 She didn’t hold a grudge though and she welcomed us to her house the next weekend for a pizza party. 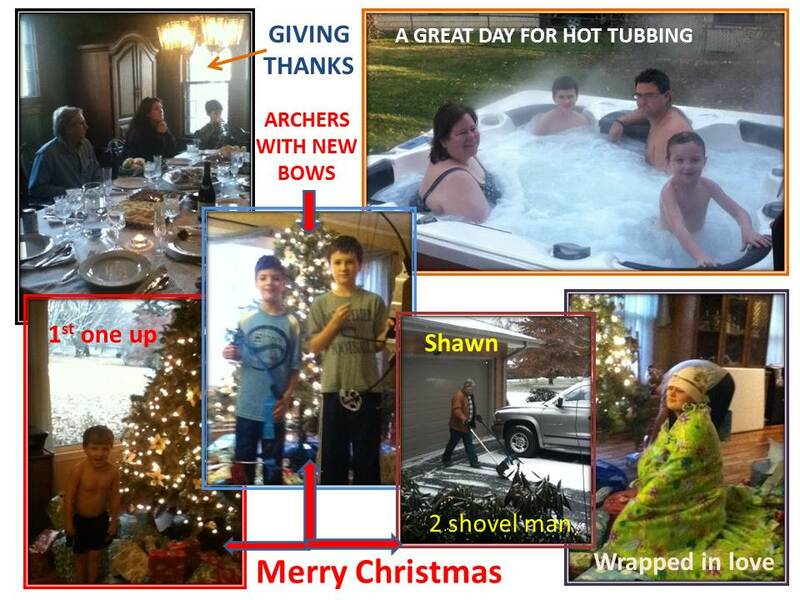 Thanks Debbie and Jimmy for sharing your family and your home with us. 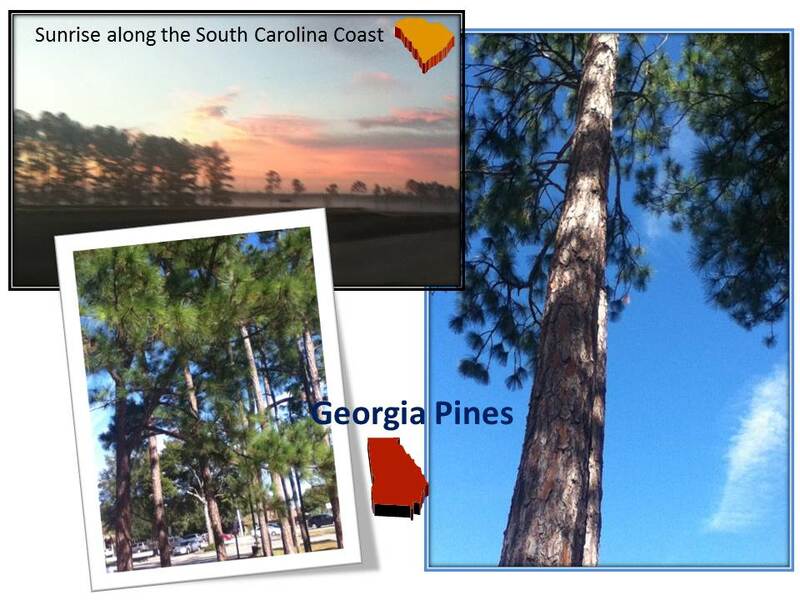 One of the many draws here is the area known as “The Grand Strand”. That’s miles and miles and miles of beautiful white sandy beach. Of course some of that beach is lined by high-rise condos and hotels which mean lots and lots of people and activity. Luckily for us, we’re at the north end of the strand and we are closest to a beach known as “Cherry Hill”. There are a few condos and hotels along this particular stretch of beach but for the most part it’s a slower paced atmosphere with fewer people. Now that Labor Day has come and gone, we’re told there will be days when it will feel like it’s our own private beach. How cool!! 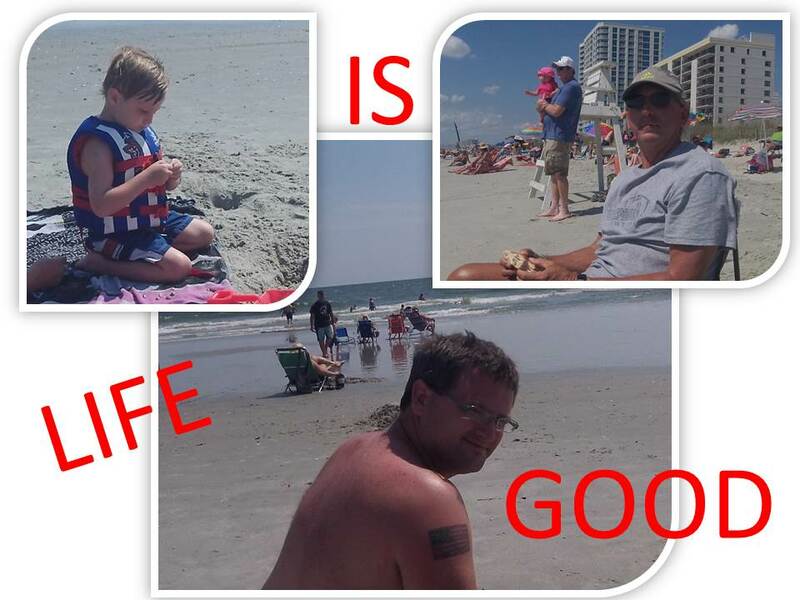 We’re about 25 minutes from the heart of Myrtle Beach proper and we’ve visited once just to see the sights. Looking through brochures after brochure, I’ve come to the conclusion that Myrtle Beach would like to bill itself as “Vegas with a Beach”. They have boats that offer a trip offshore for your gambling needs and there are lots of acts along the Strand that are “direct from Vegas”. This includes Legends in Concert, Illusions of Magic, Comedians and Hypnotist and a gigantic number of “all you can eat buffets”. It’s nice in that it offers tourists and locals some great entertainment BUT believe me, it’s a far cry from Vegas…and I should know. We’ve been pretty busy the past 30 days. It’s an adjustment to be back in the States. Everything moves much faster than we’ve been used to. We are trying not to get caught up in the rush but some days it happens. When it happens too often, we make sure to make time to head to the ocean so we can fill up on serenity and peace. 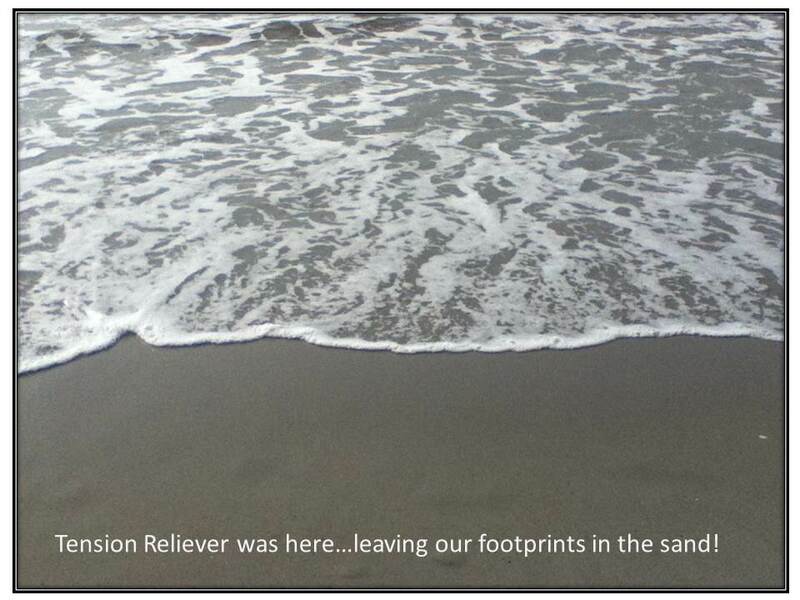 A walk along the beach is good for whatever ails you and we’re trying to take the cure as often as we can. 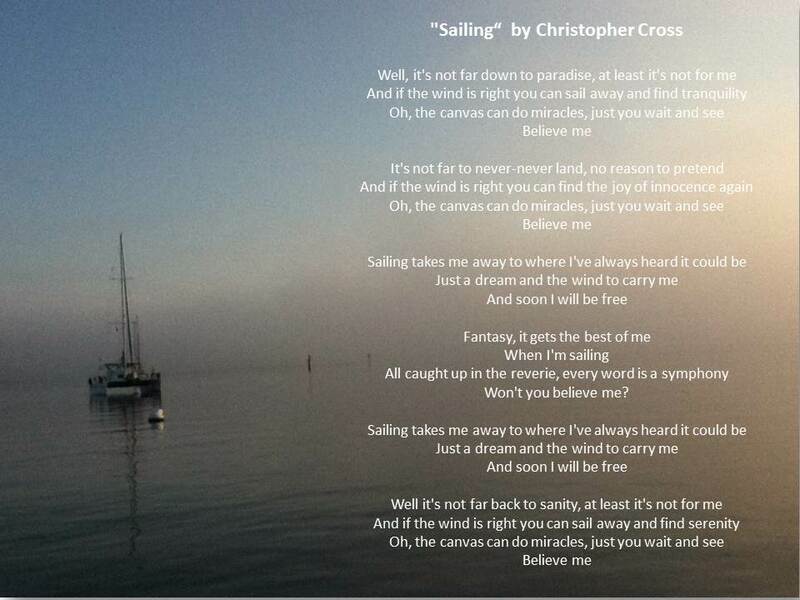 Until my next post…listen to “Sailing” by Christopher Cross on YouTube, you’ll be glad you did. As you know, Tension Reliever had a new crew member the past several weeks. 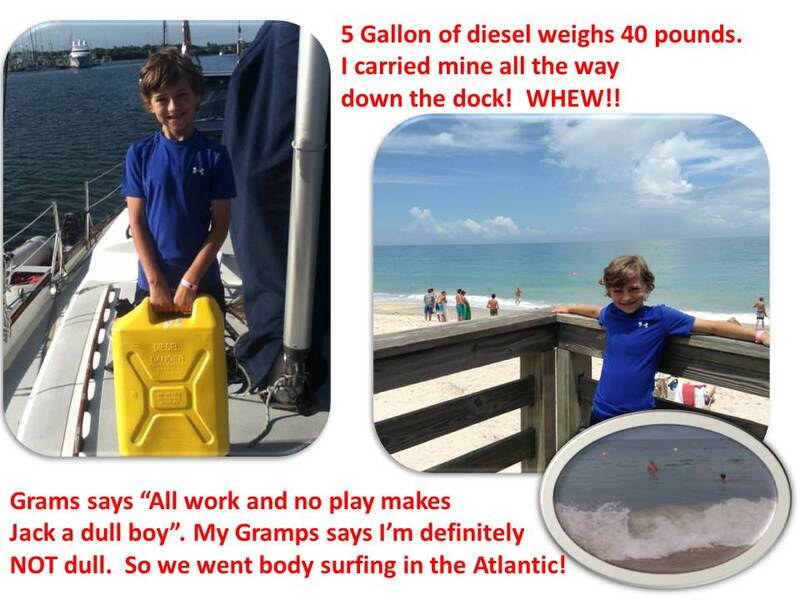 Our grandson, Jack, spent a total of 27 days aboard and every moment was a delight! He was eager to learn and was a quick study. 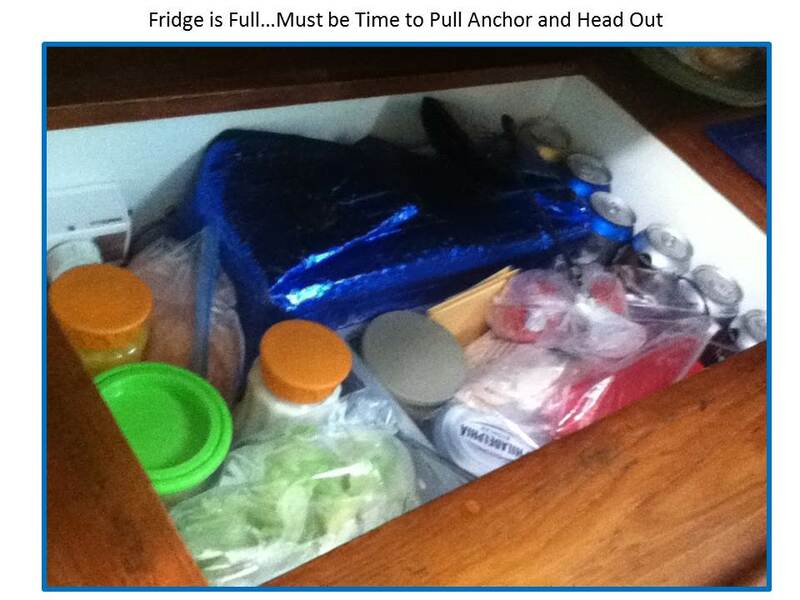 He really enjoyed the evenings at anchor but he was always ready to “weigh anchor” and head out to new territory every morning! He asked a million questions (and I’m not exaggerating much) and remembered what you told him. 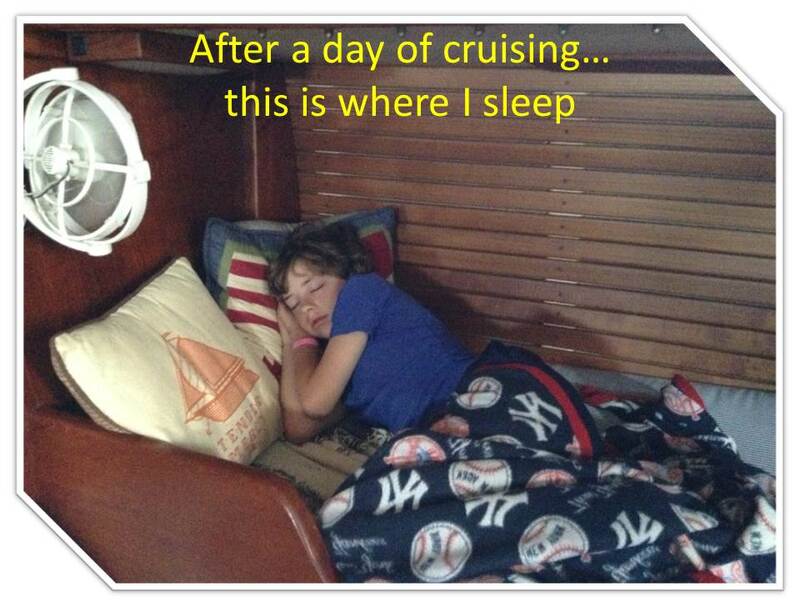 His take on all things “cruising” had us laughing from morning til night. My only regret was that he didn’t particularly like to write. 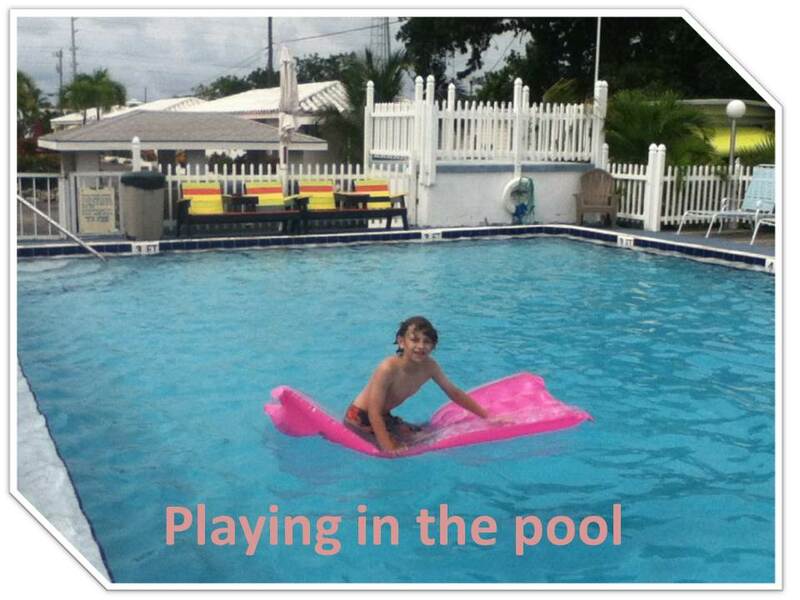 He had fun picking out his pictures to post and putting sayings on them but alas, that was the extent of his writing. Maybe someday!! 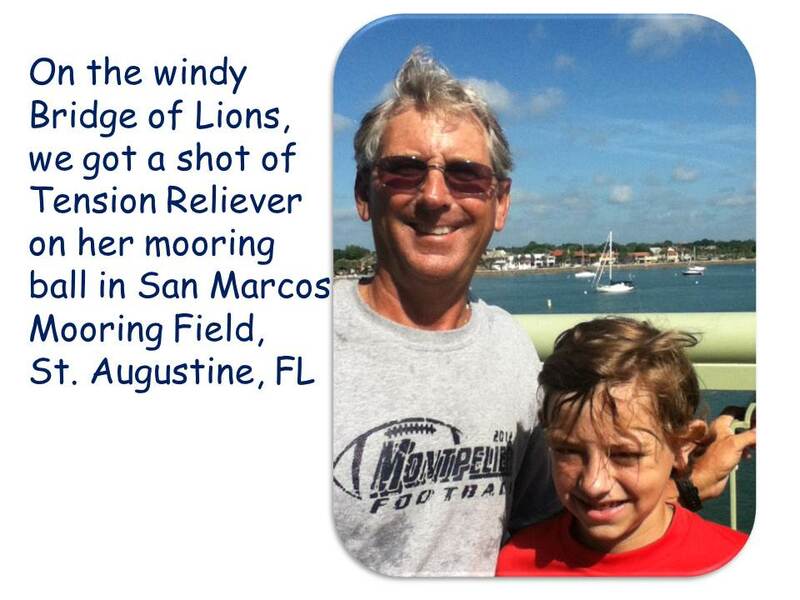 We decided to moor in St. Augustine, FL and have Jack’s dad, Steve, pick him up there. We had a couple projects to work on and one was mounting a new US flag. This is the fourth one in our 2 year journey and believe me the last one was in major need of replacement. The wind and salt air are not kind to pieces of material hanging off the stern of the boat. Steve flew into Jacksonville and rented a car for his trip to St. Augustine. As we couldn’t wait to see Steve (especially Jack), we decided to try the public transportation system and meet him at the airport. His flight was due into Jacksonville around 10:40 AM, so we had to get an early start. We dinghied into the marina around 4:00 AM and had about a mile and a half walk to a bus stop. It was still dark when the bus came along and it took all three of us waving and hollering to flag him down. It was an hour and a half bus ride into Jacksonville’s Avenues Mall. There we had a small wait for a Jacksonville bus that took us downtown to the Rosa Parks Bus Depot. There we leaned that if we were 62 we could ride all the Jacksonville buses for free. We had to apply and get a card but that only took about 20 minutes and we were good to go. From Rosa Parks, we had about a half hour bus ride to the Jacksonville Airport. We arrived about 1 hour before Steve’s flight landed so we thought we’d planned well!! Total for the three of us to ride the public transportation system from St. Augustine to Jacksonville Airport was a whopping total of $6.00. Now, anytime in the next 5 years that Rick and I get to Jacksonville we have free pass transportation! Can’t beat that!! 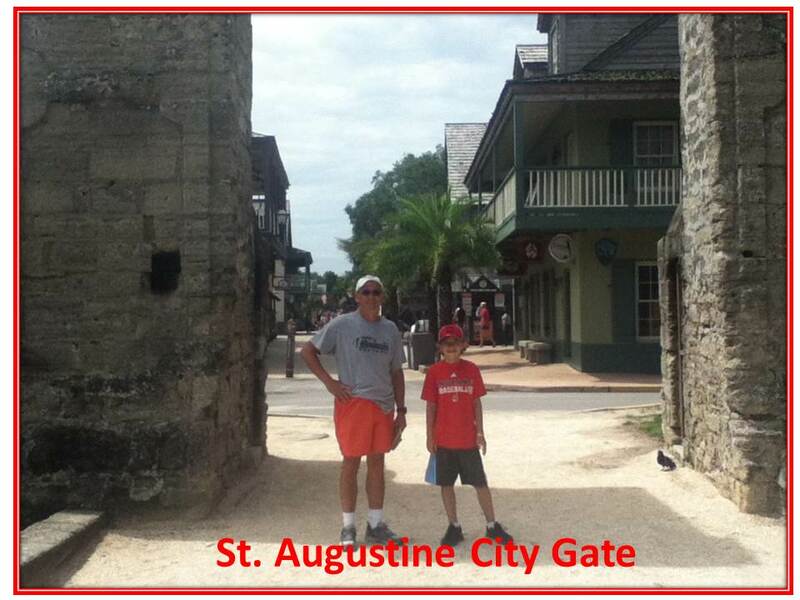 St. Augustine was such a great city to explore and we did plenty of that. 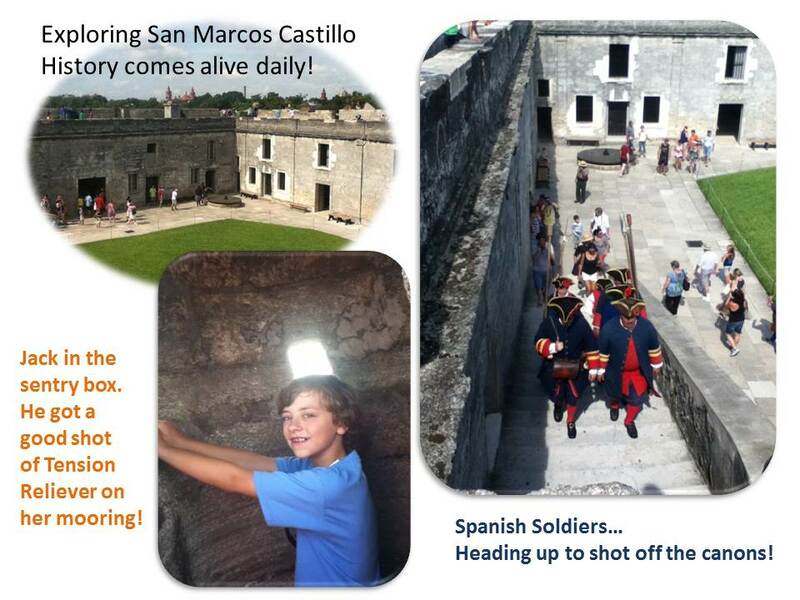 Jack wanted to wait until his dad came to explore the fort “San Marcos Castillo” so we got to do that with both of them. 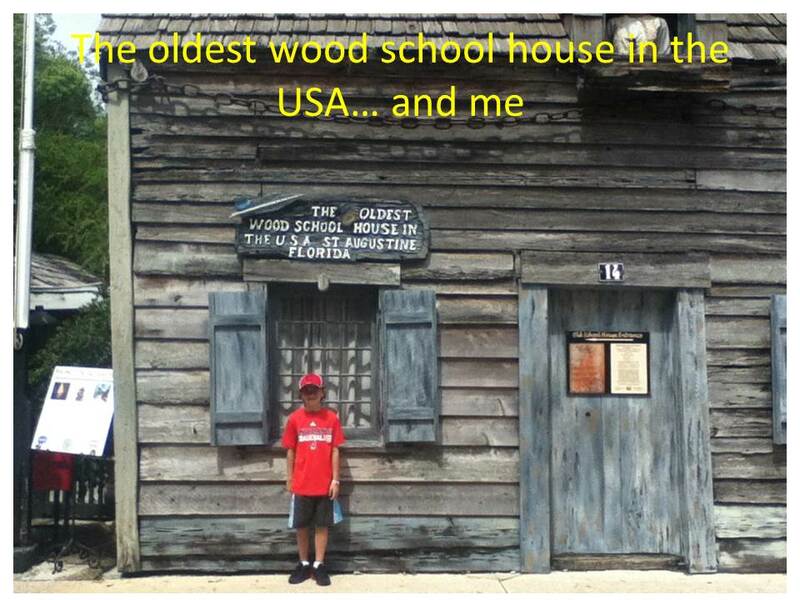 Add in a visit to the “oldest school house” and a rousing game of miniature golf and we had ourselves a grand time!! 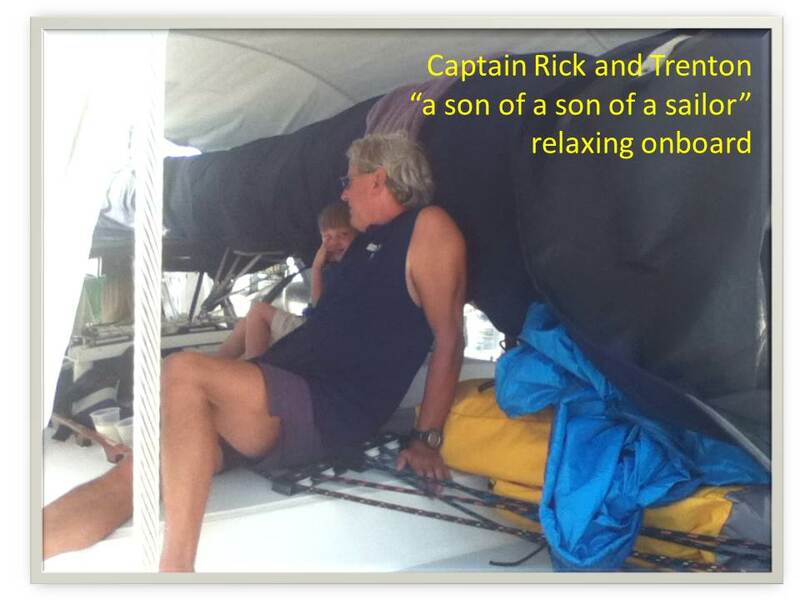 We said goodbye to Jack and Steve on Sunday afternoon and noticed at once how quiet the boat was. But, we had work to do as we wanted to leave St. Augustine on Monday around 1:00 PM to catch the rising tide as we went out the St. Augustine Inlet. This is an inlet best done in good weather and seas and we were certainly blessed to have both in our favor as we motored out through the twisting channel markers. Waves were crashing on both sides of us but we held at least 14 feet of water in the channel. This trip would be another long sail. 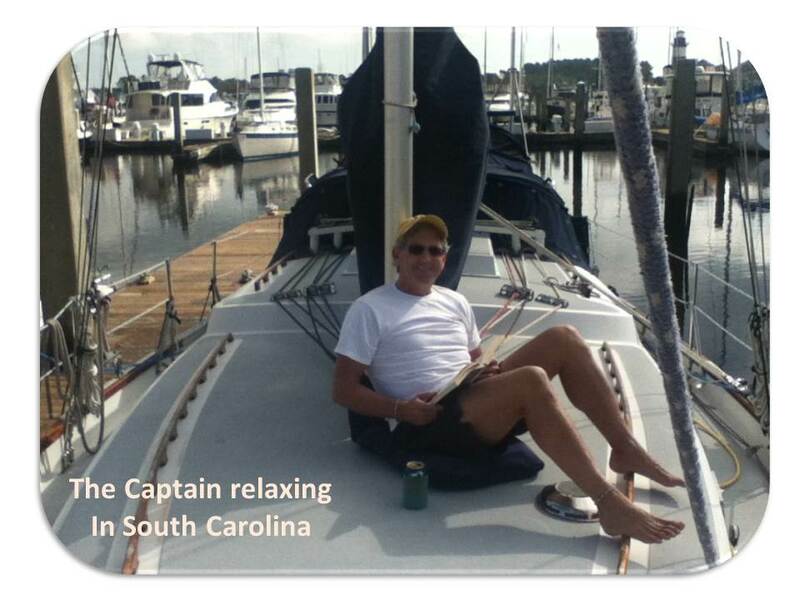 We were headed to Georgetown, South Carolina inlet and that would take 2 nights and 3 days. Once again we were lucky. Storms formed along the shore but we were sailing about 10 miles offshore so we missed all the fury of the afternoon and evening thunderstorms. We saw lots of lightning strikes, heard lots of thunder and saw where rain was pounding the coast but we sailed on and had only a slight sprinkle one evening. 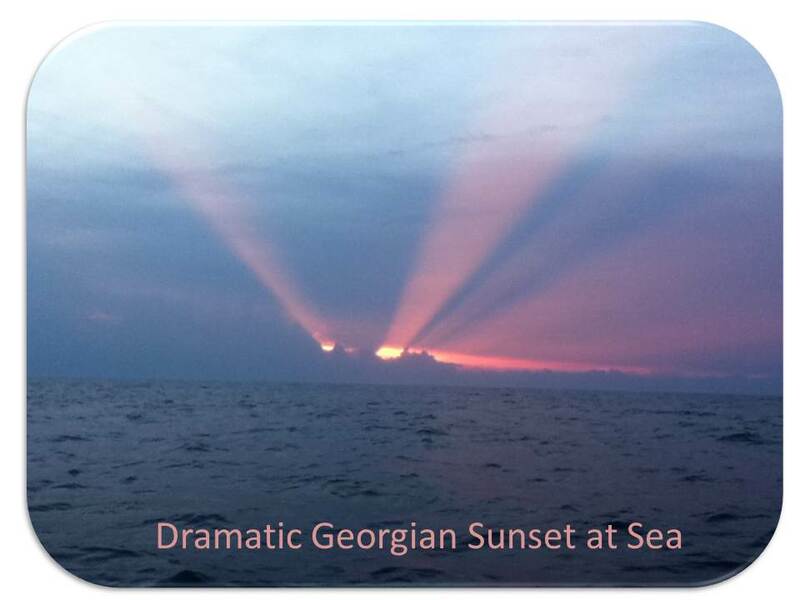 With all the weather along the coast we had ring side seats to some beautiful sunsets! At Georgetown, South Carolina we entered the inlet with a flooding tide. That means the tide was coming in and so were we. At one point, we were going almost 7.5 knots and we were glad for the extra speed. Before the day ran out of light, we wanted to get about 20 miles past Georgetown to an anchorage in Bull Creek. The inlet at Georgetown is called Winyah Bay. It’s a deep channel and very well marked but it’s shallow if you don’t stay lined up just right. There were 5 sets of “range markers” to follow to help keep us on the straight and narrow and those are definitely nerve wracking. We have to line up the short range marker with the tall range marker and then when they line up, you stay on that course and keep them lined up. Sounds easy…but believe me it’s tedious work. Especially when one of the ranges you have to watch behind you for a section of the range. Sure glad there are two of us onboard. At this point, we were sure missing Jack and his eagle eyes!! 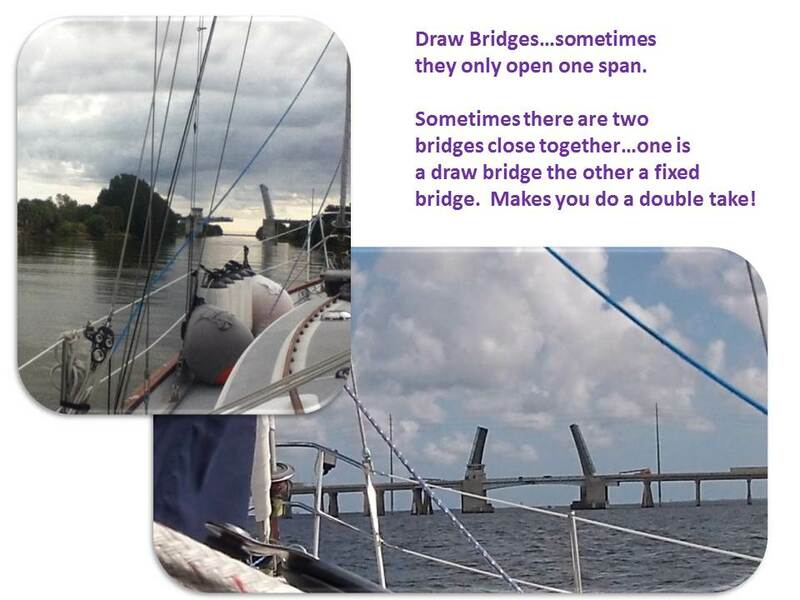 As we entered the ICW at Winyah Bay, we had 13 bridges before we reached our final destination of Little River, South Carolina. 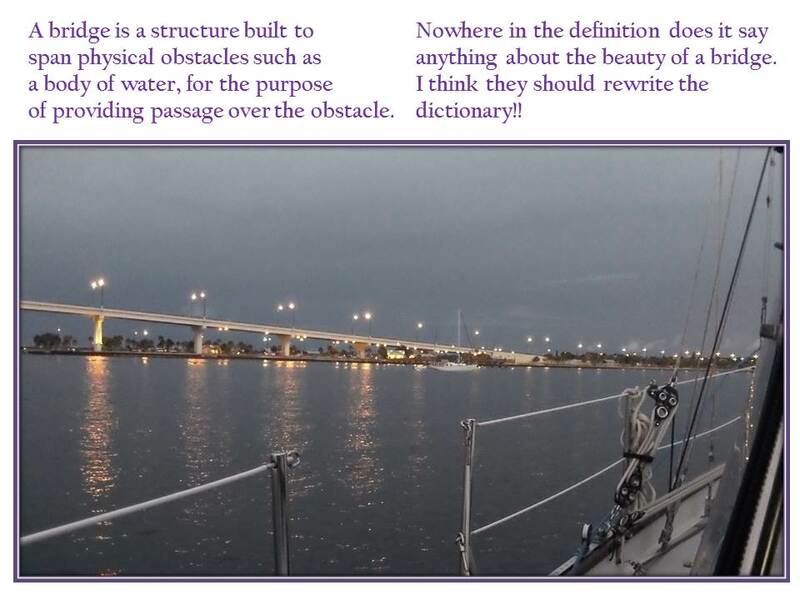 Bridges are something you have to learn to live with if you are going to travel up and down the Intracoastal waterway. We counted them up for Jack before he left and from Marathon, Florida to St. Augustine, he traveled through or under 45 bridges and sailed almost 450 miles. Adding those 45 bridges to the 13 we still had to go and you can tell that a lot of our time is spent near bridges. There are fixed bridges which offer no resistance to us as all we have to do is pass under them using the middle span. They are 65′ high at Mean Low Water (MLW) and we can clear them by a couple feet. Then there are lift bascule (lift) bridges. The spans pivot up and let us pass through. 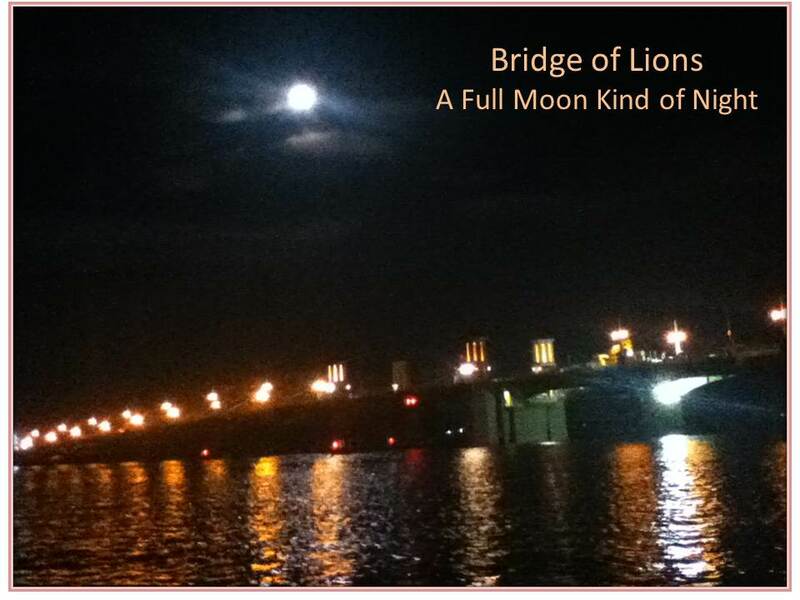 This takes a call to the bridge tender and often a wait time due to traffic or schedules. Sometimes they will only lift one span due to work being done on the other. That gets a little tricky if the current and tide are running faster than 3 or 4 knots. Sometimes there are double spans if the highway is large and has double lanes going both directions. The last bridge we had to open was at Little River. It’s a swing bridge. It doesn’t go up or down but sideways. Yep, you might say I have a thing for bridges. They always cause my heart to beat a little faster and my palms to sweat just a little and as soon as we pass through I breathe a little easier. Of course, Captain Rick says that’s because we kiss under or through every single bridge. Maybe he’s right. When we sailed in the mid 90’s, our first bridge was going into Charleston, South Carolina and we kissed underneath it. Since that day, we have kissed under every single bridge we’ve passed through. Maybe that’s why I like bridges so much! Here are some shots of my favorite “kissing zones”. 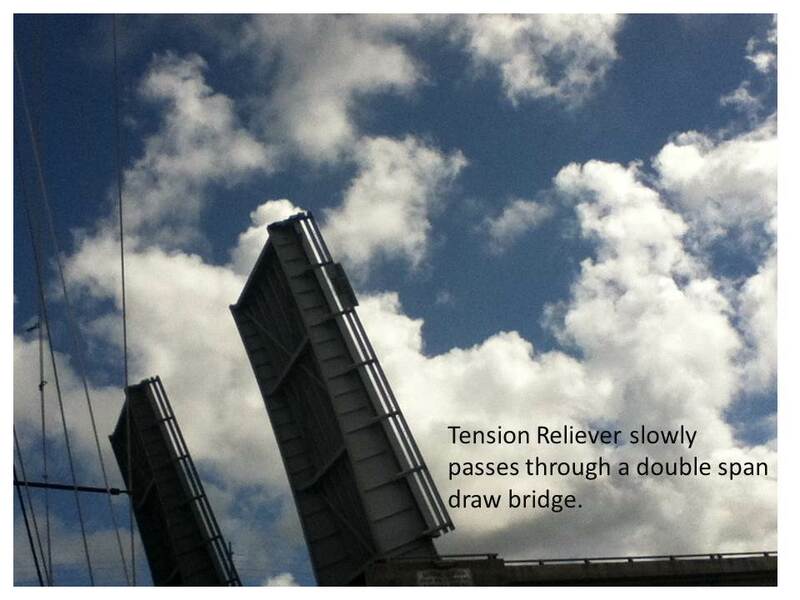 Tension Reliever and crew have spent the past couple of weeks moving north along the East Coast of the US. 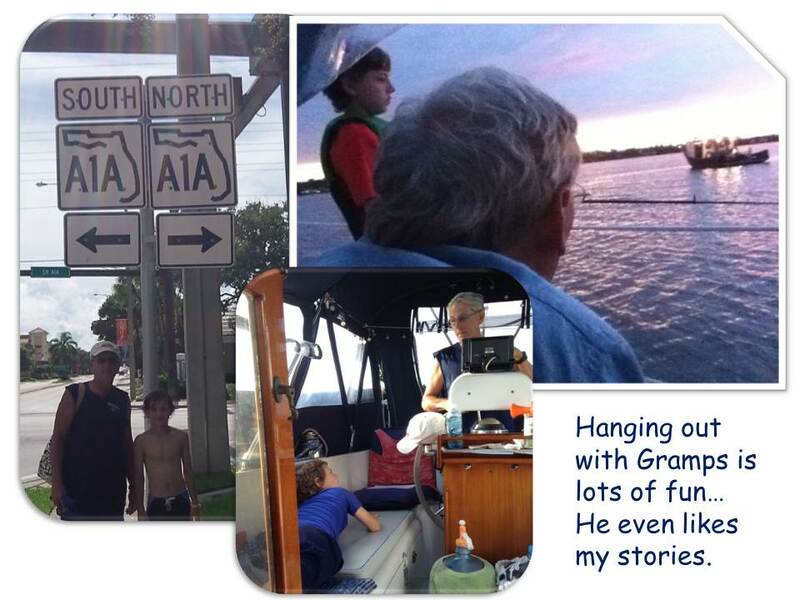 We left Lake Worth early on Saturday morning the 13th and learned our first lesson from the ICW. We had a bridge about 1/2 mile from our anchorage and our guide book said the bridge opened on the hour and the half hour. We got to the bridge about 10 minutes early and sat waiting for the bridge to open. A few minutes after the designated time, the bridge tender called us on the VHF radio. He asked if we were going to go through the bridge and we said yes. He said we had missed the opening and it wouldn’t open again until half past the hour. Evidently, the bridge doesn’t open unless you call and request the opening. Even though we were sitting there idling our engine, he didn’t call a few minutes before the bridge was to open. Oh well, that taught us a good lesson. Even if a bridge has scheduled openings, you have to call and request they open for you. Luckily, we had enough room to turn the boat and stay close for the next opening. That slowed our day a little and it wouldn’t be the last bridge that would cost us time as we headed north. Cruising up the ICW for us means we run the engine hours and hours on end. We sometimes get to put out a head sail and add to our motoring speed but mostly it’s motoring and watching the red and green markers. Going north on the ICW we need to keep the red markers on our left and the green markers on our right. That sounds easy but sometimes its not as easy as it sounds. It takes all of us constantly on the lookout as getting out of the marked channel means shallow water and possibly grounding. 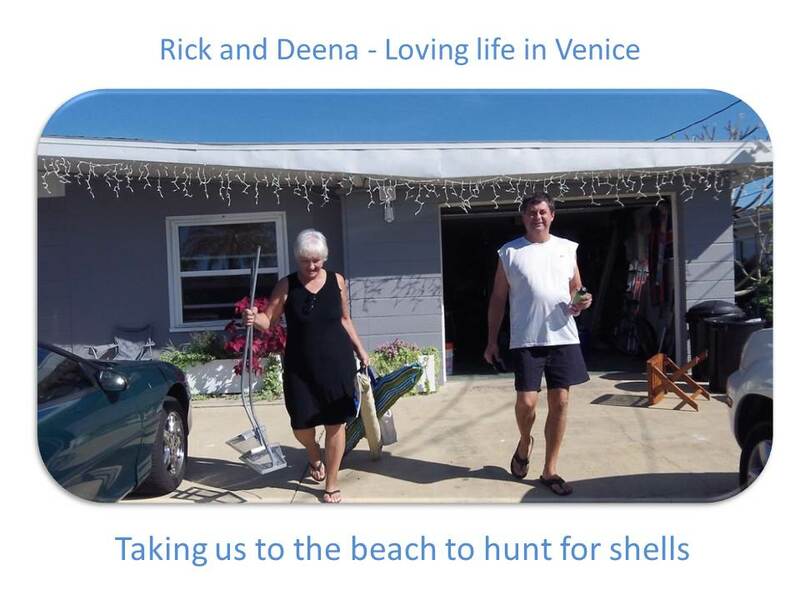 We spent our first anchorage at Jensen Beach. We anchored just north of the bridge in a spot that showed 7 – 10 feet. We should have been okay BUT there are always high spots inside anchorages. We spent a great night and had a beautiful sunset but in the morning when we got pulled up the anchor and I put the engine in gear to move forward we did nothing but sit there. We tried to power off the “little hill” and we even had a local fisherman try to rock us off with wake from his powerboat but no luck. Finally, after trying everything we could, we called on the services of TowBoat US. 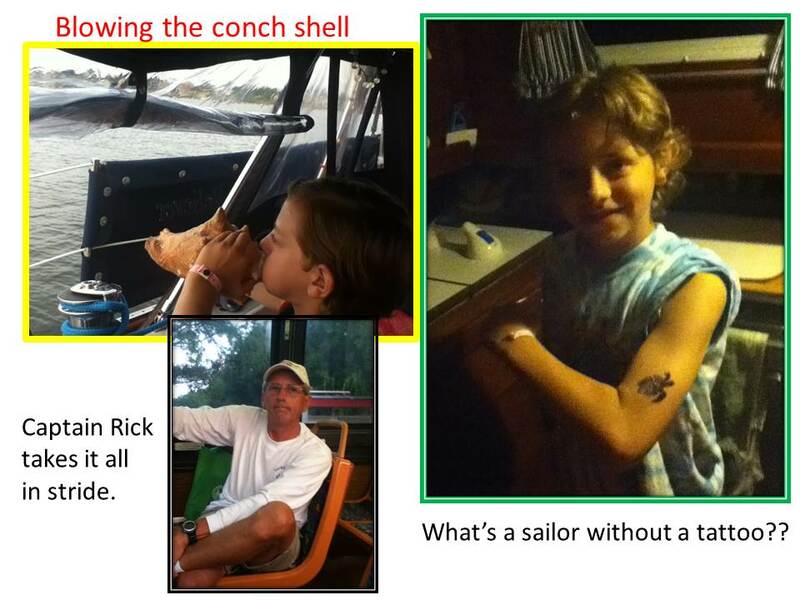 When we were home, we had updated our towing insurance as we knew the ICW could cause us some problems. In less than an hour, they arrived, pulled us about 30 feet out to open water of the channel and we were on our way. The coverage cost us around $187.00 a year and the tow would have cost us more than that! 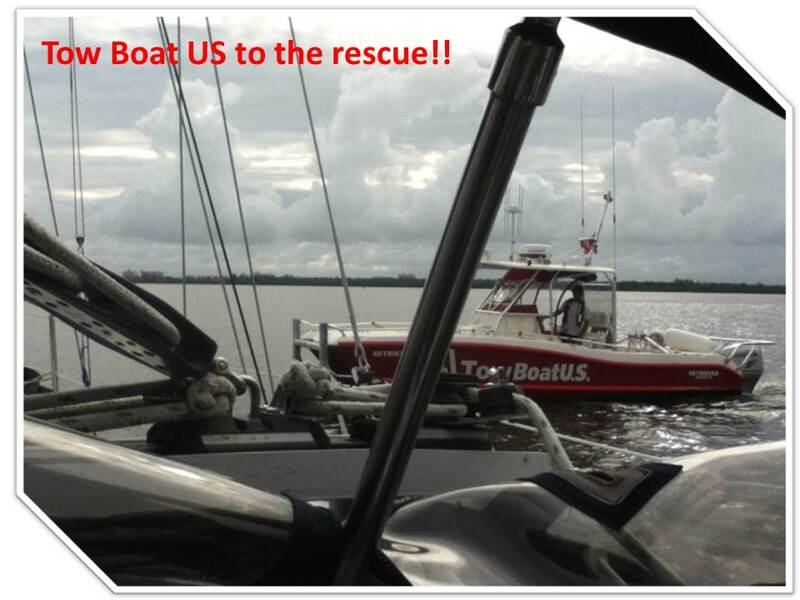 Having free towing as you transit the ICW is priceless…thanks BOAT US. Next stop was Vero Beach. They have a beautiful city mooring field and we were happy not to have to anchor. Vero Beach offered us the opportunity to rent a car and travel by land to Ft. Pierce. We have CNG (compressed natural gas) for our stove/oven. Finding places to fill tanks isn’t easy and Ft. Pierce was the first place we’ve found since we left San Diego. We had to turn our tanks in and get 2 newly certified tanks so the cost was a little more than we wanted. Two tanks filled with CNG cost us $150.00. Next time, we should only need to fill then so the next fill up should only be around 40.00 per tank. We walked to THE BEACH at Vero Beach and we all got to body surf in the beautiful water. It was a little cold at first but after the first wave knocked me down it warmed up real quick. Jack thought this was super cool and he thinks Florida has a lot of potential as a place to live. 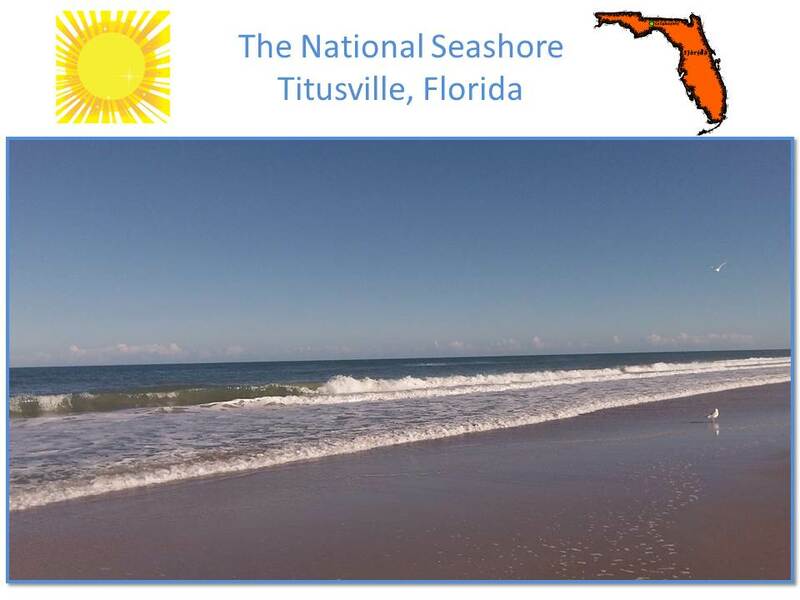 We left Vero Beach headed to Titusville. We stopped about half way and anchored just off the ICW in about 12 feet of water. 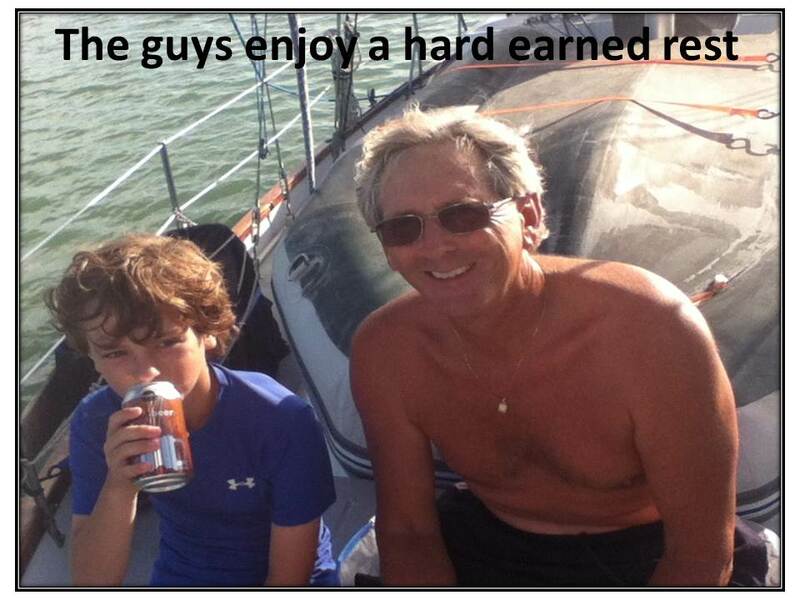 After our last anchorage at Jensen Beach having 12 feet of water under us made for a great night at anchorage. The next day found us on Florida’s Space Coast. 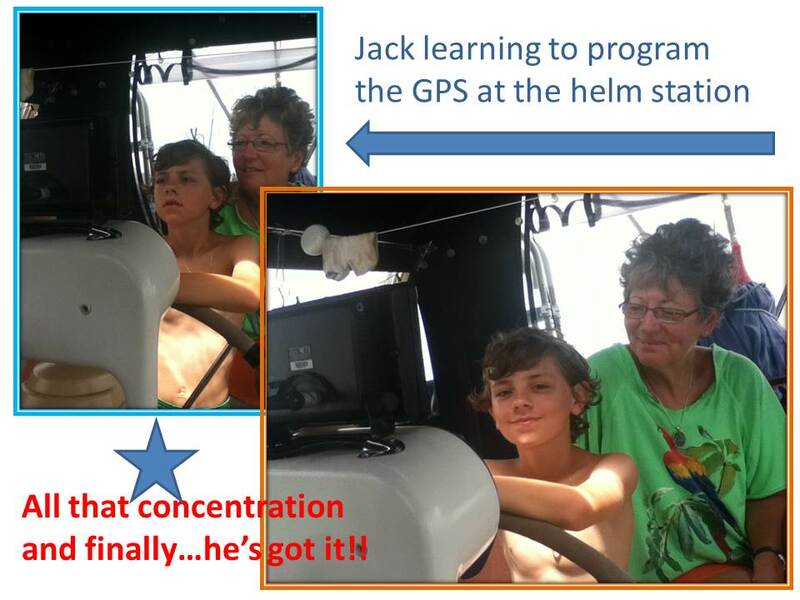 We had a good trip and Jack even took his turn at the helm. As we neared our mooring at Titusville, we passed by the large NASA building at the Kennedy Space Center and that certainly spiked our anticipation of a trip to the Cape. 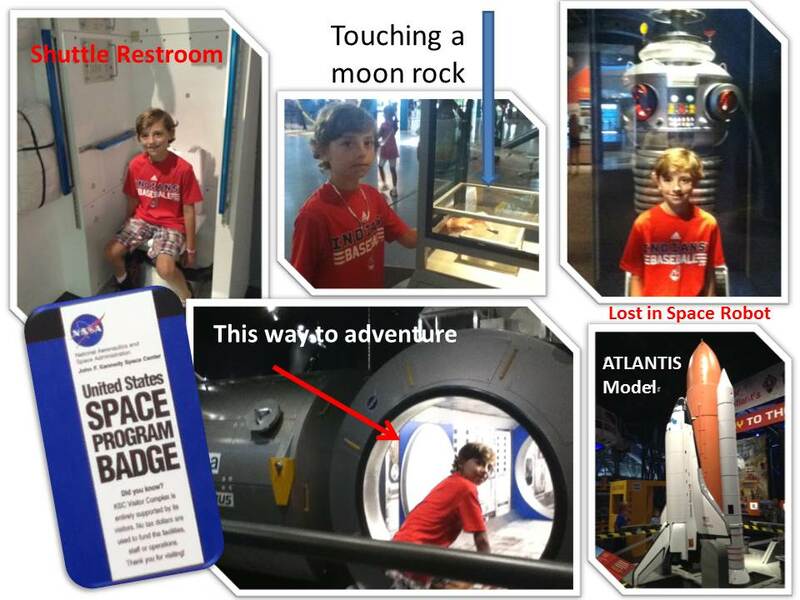 I was dismayed to find out that Jack wasn’t a big space fan. My generation grew up with all the first. First man in space, first man to orbit the earth, first man on the moon etc. etc. etc. 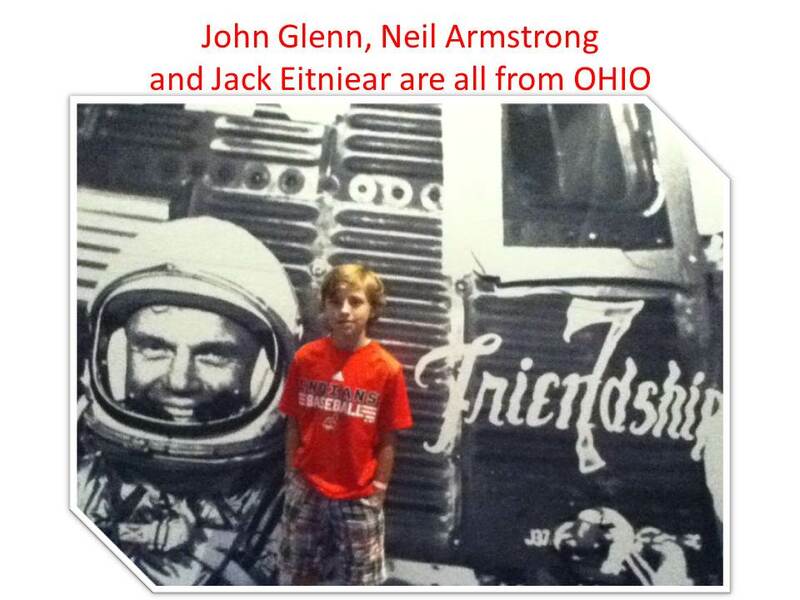 He knew the names Neil Armstrong and John Glenn and he knew we’d been on the moon but that was about it. 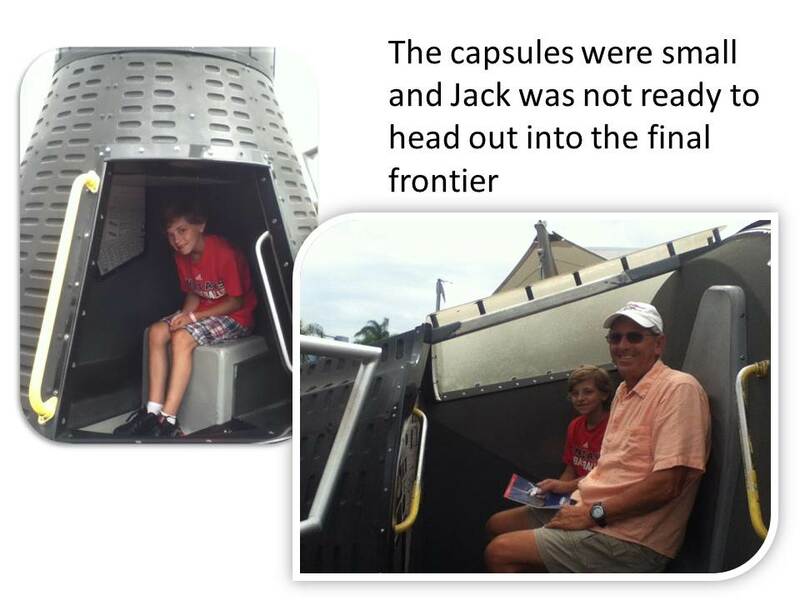 By the time we finished visiting the local Space Museum in Titusville and having a past employee of the Space Center as our guide, Jack was ready to tackle the Space Center. We arrived at the gate at 9:00 AM and spent a full day exploring a most magical place. We all enjoyed the displays and hands on area of the Mercury and Gemini projects but what really tripped our trigger was the new ATLANTIS space shuttle display. 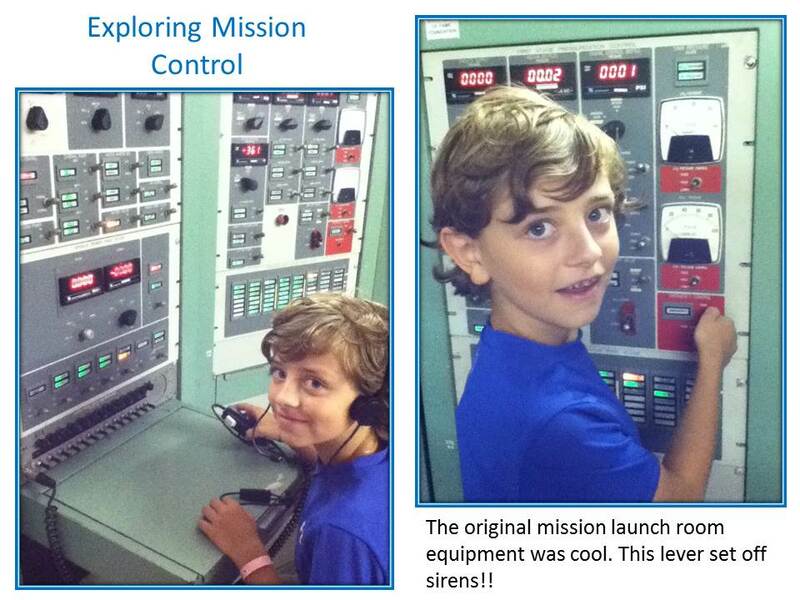 We all felt like little kids as we explored the displays and even survived the “Launch Simulator”. The IMAX movie about the moon landing was second high on our list and we all just stood and stared at the size of the Saturn V rockets that propelled us into space. 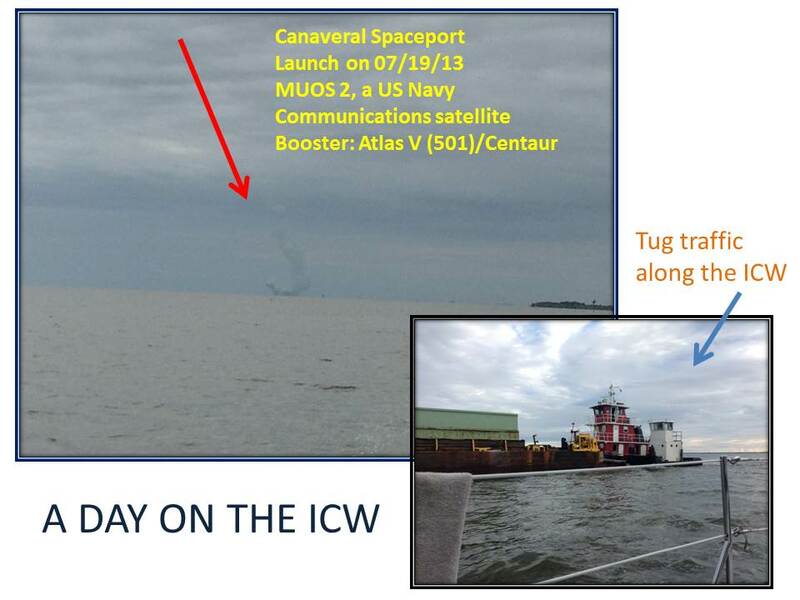 The morning we left Titusville and headed north towards Daytona Beach, we were lucky enough to see the smoke trail and hear the sonic boom as Cape Canaveral Spaceport launched a US Navy communications satellite. It was scheduled to launch at 8:51 AM and it went off right on schedule. We were just north of the Cape on the ICW and had just transited a narrow cut complete with opening bridge when Captain Rick hollered “There she goes.” Jack and I both snapped pictures of the smoke trail and then about 45 seconds or so after we saw the smoke trail we heard the sonic boom. WOW!!! It rolled across the open empty waterway for about 30 seconds and we were all doing high 5’s. The oldest city in the US means I’m not the oldest thing around anymore!!! We’ve seen the oldest school and the oldest house and like me they take a little makeup to make them look better!! 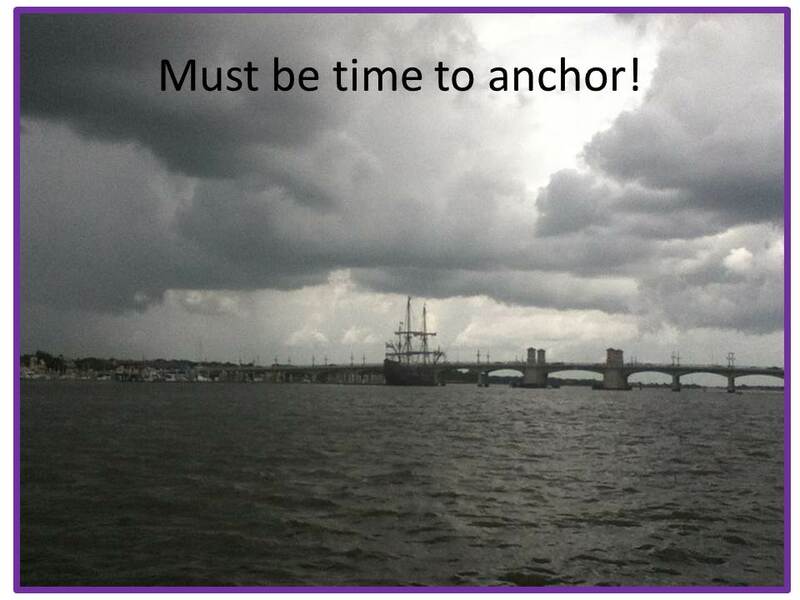 As we waited for THE BRIDGE OF LIONS to open for us we noticed a large Spanish sailing ship anchored at the city marina. 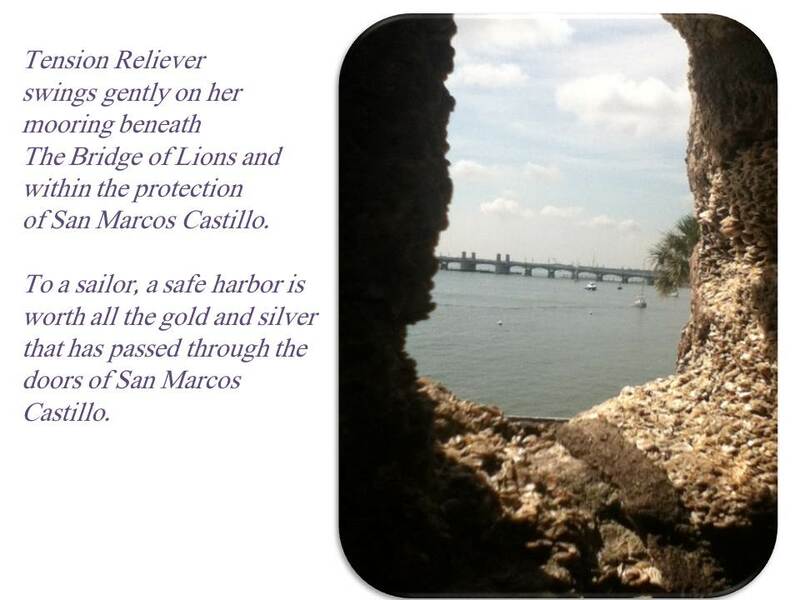 It was actually built here in St. Augustine and is a replica of a 1600 Spanish sailing ship. We are going to spend about 10 days here. Jack’s dad, Steve, will be flying in to pick him up this weekend and we’ve been enjoying the city although we are saving visiting “San Marco” fort until he gets here. The ICW to this point has been friend and foe. As we came through the inlet at Ponce de Leon, we found the ICW channel shoaled all the way across. We tried 3 times to get through but grounded each time. We finally talked to some locals and found out that the Coast Guard had removed some of the markers as they were going to start dredging. They suggested we wait for high tide and with an extra foot or two of water we could get over the shoaling. So, we dropped anchor and sat waiting for the river to rise and then we passed over with only a few inches to spare. 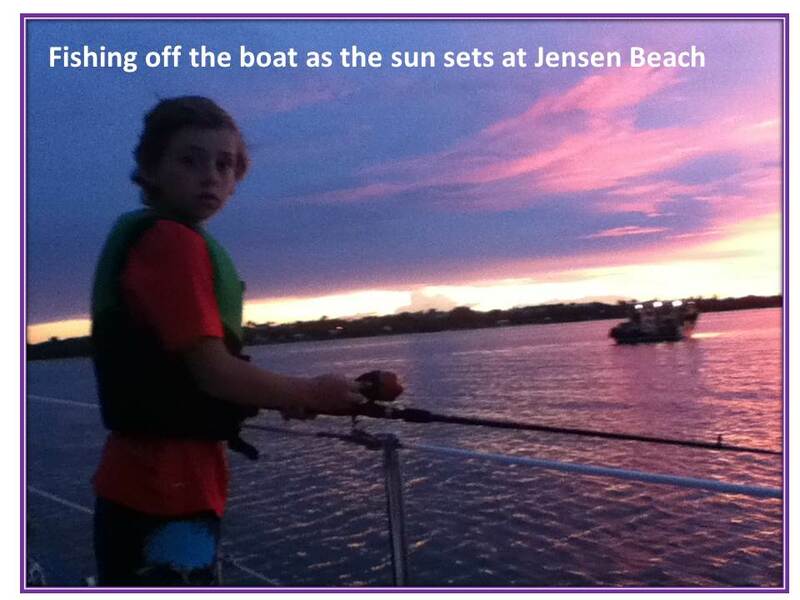 We’ve seen beautiful wildlife along the shores and Jack has been thrilled by the dolphins that swim along with us. We’ve even seen some manatees and pink flamingos. We’ve also traversed areas that 30 foot off the side of our boat was shoals and little islands. 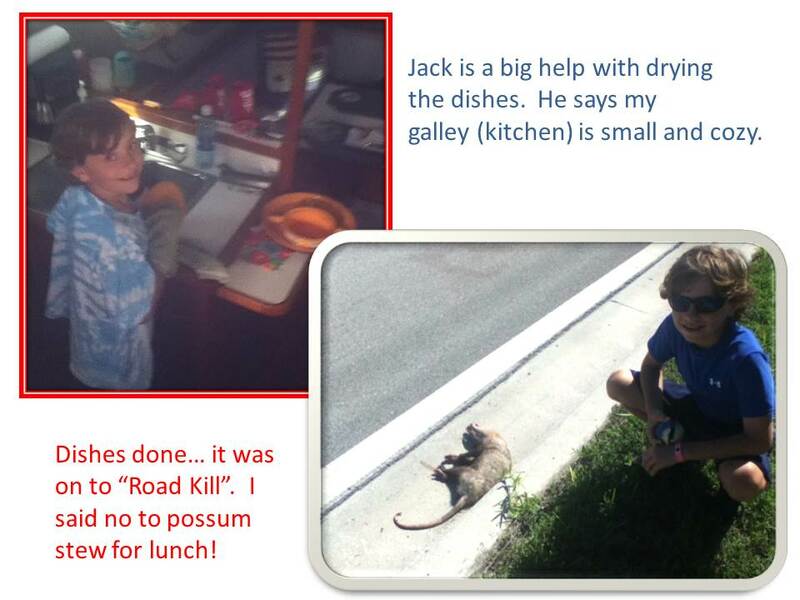 It has been a tedious trip and we have been glad to have Jack along as crew. When he leaves us, we’ll head offshore and head north probably to Charleston, South Carolina. Can’t imagine what it will be like not to hear “Hey, Grams”. He’s been a great asset to the crew and we’ll miss him and his spirit of adventure. Until my next post…remind someone about the space program and know that it’s still an on going project! 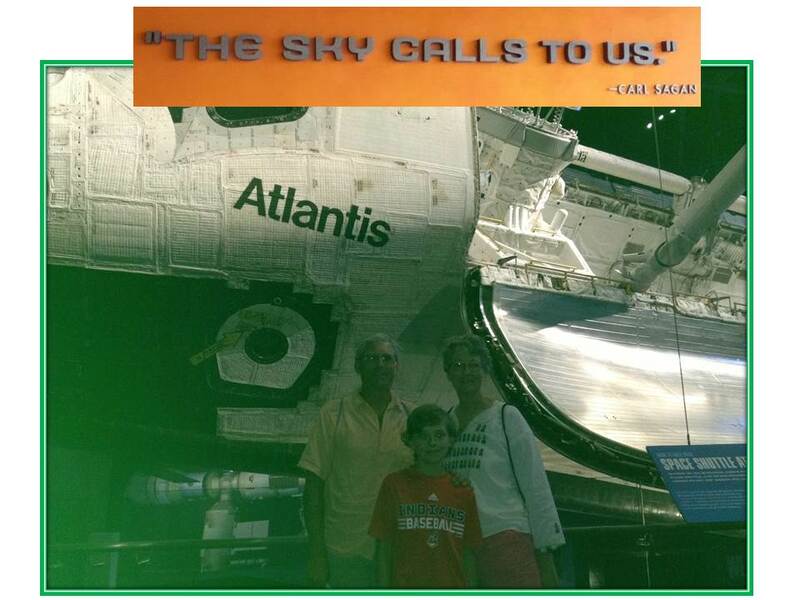 Our grandkids will get to follow the episodes of The Space Station as it reaches it’s heyday!!! 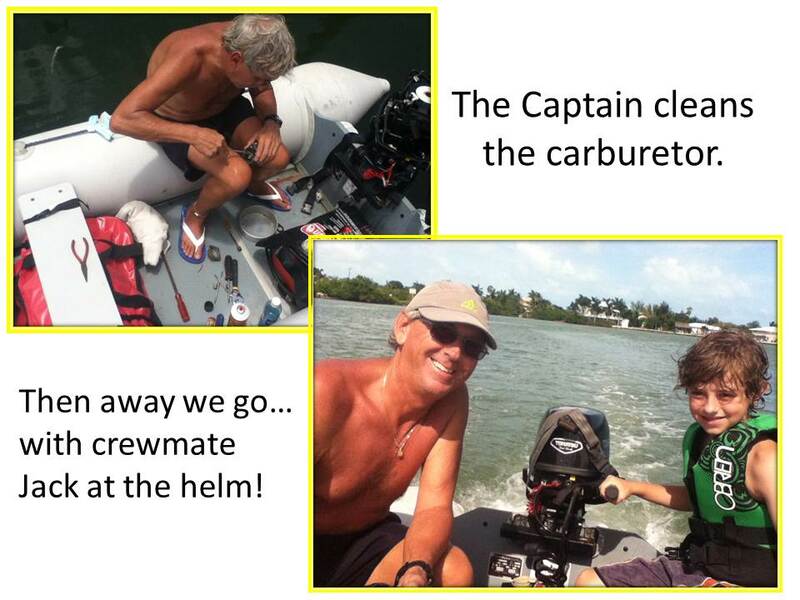 The crew of Tension Reliever has finally left the Keys and headed north. 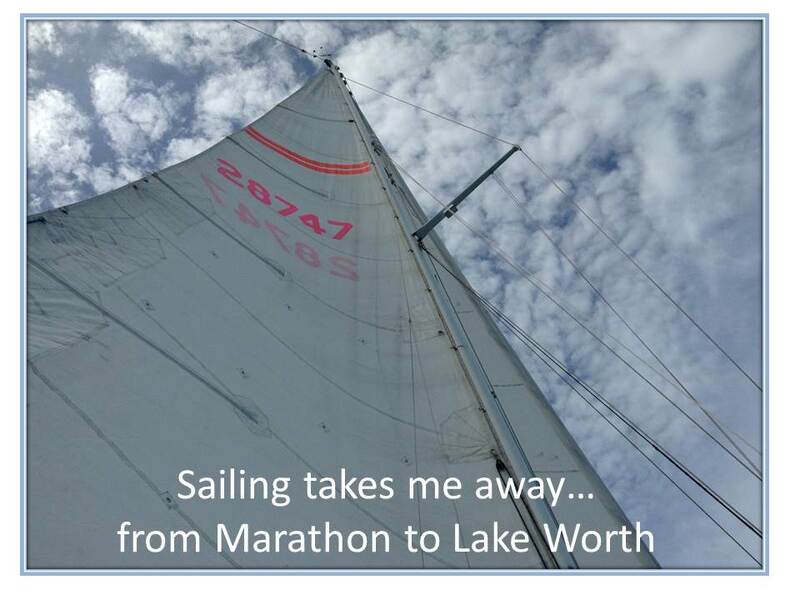 We were hoping to leave Marathon on Monday, July 8th but the weather had another departure date in mind. Tropical Storm Chantal was busy making its way up the Caribbean and we decided we should stay an extra day or two in a safe harbor and see what was headed our way and where it was expected to go. By Wed. morning, July 10th, it was starting to break apart and would cause possible severe weather storms but not tropical storm force winds and rain. We let go the dock lines from the mooring ball around 7:00 AM and headed west and then north. 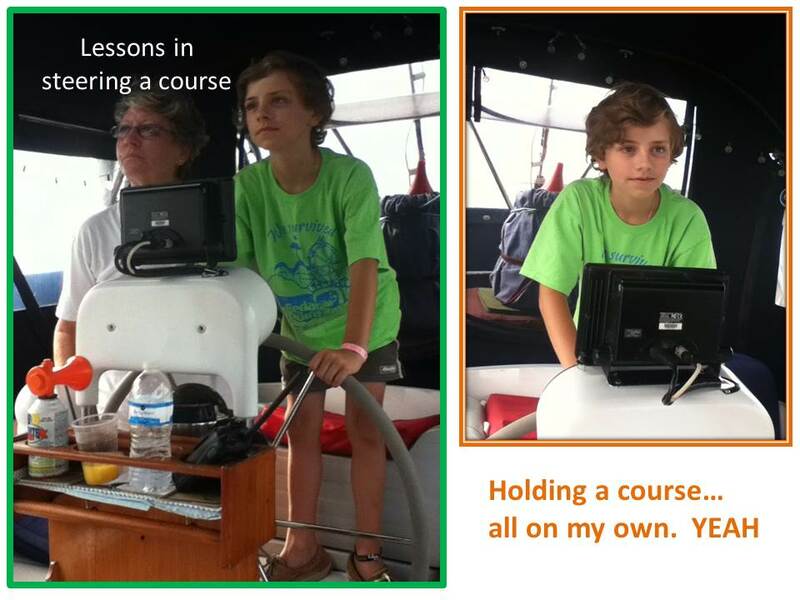 We weren’t sure where we were going to stop as that depended on how our newest crew member Jack took to sailing out on the sea. 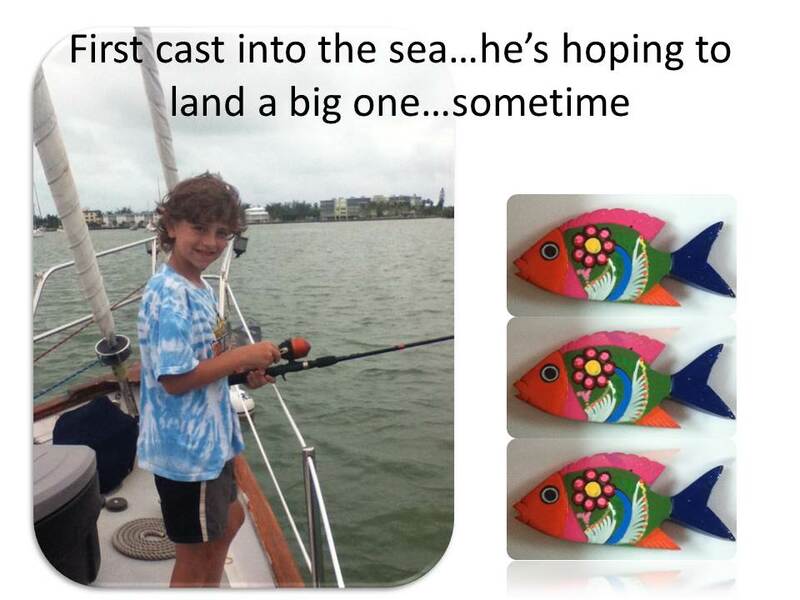 Lucky for us, he took to it like the proverbial fish takes to water and we did an overnighter all the way from Marathon to North Palm Beach. Sailing in Hawks Channel (an inner channel which runs between the ocean reef and the land); we spent a few nerve wracking hours after dark watching for channel markers in very shallow waters. We passed the city of Miami around midnight and the city lights were mesmerizing. 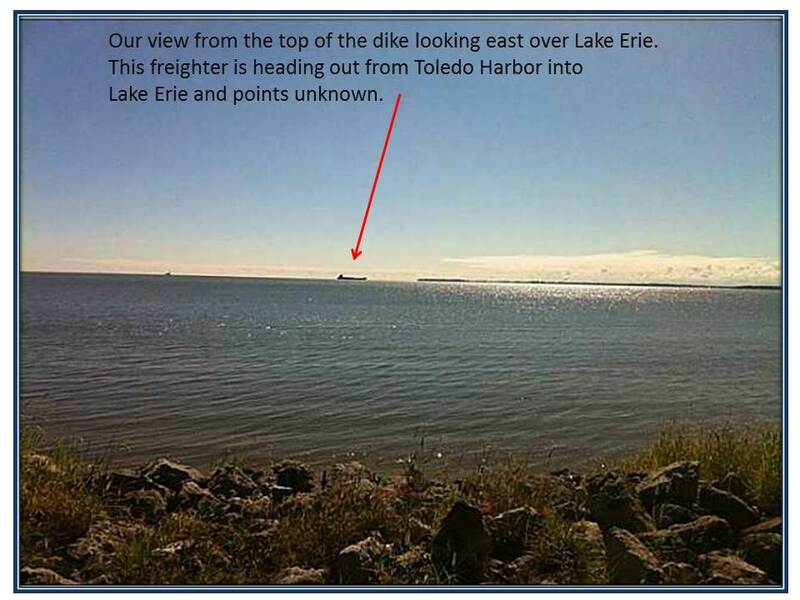 We tried to enjoy the view while we were dodging anchored and moving ships in the outer harbor. That definitely kept us all hopping. Glad we had the experience of the harbors at the entrances to the Panama Canal to give us experience in dealing with big ships. 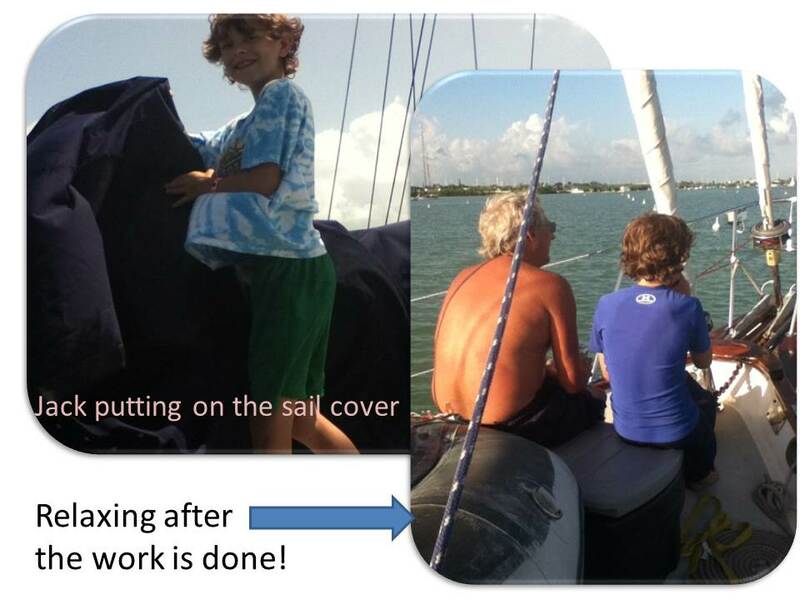 We sailed offshore for about 30 hours and entered into the Intracoastal Waterway (ICW) at the Lake Worth inlet. 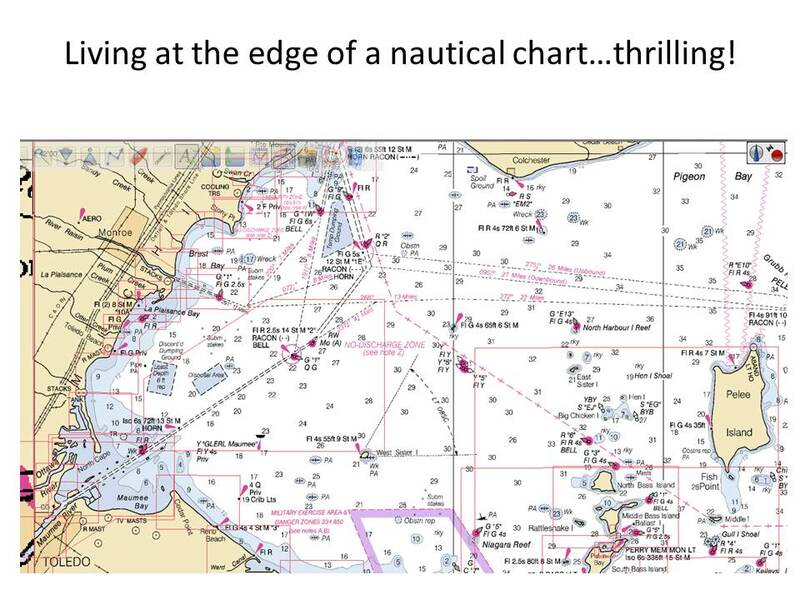 When you’re sailing offshore there are several inlets where you can enter harbors and hook up into the ICW but a lot of them have shoaling and are not recommended for cruising ships. 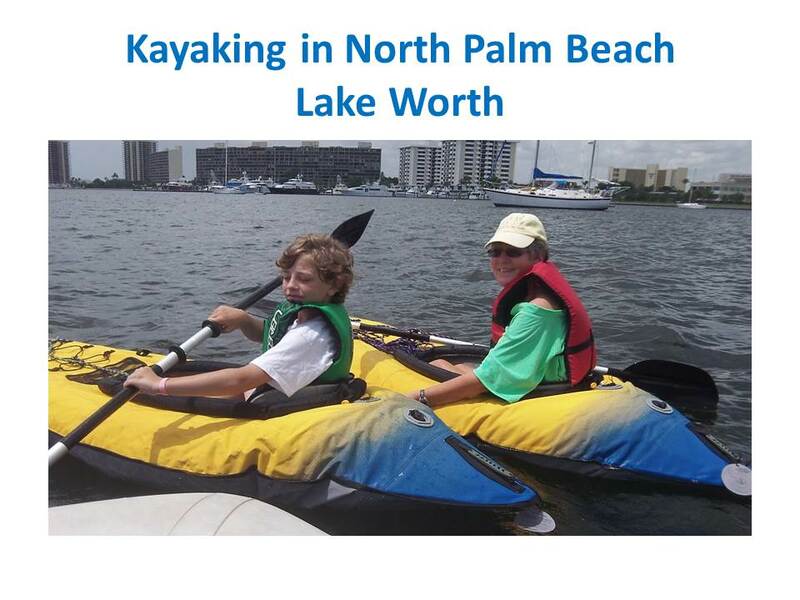 The Lake Worth inlet is large and well-marked with channel markers which make for an easy entrance. The ICW is a marked waterway that goes from Virginia to Miami. 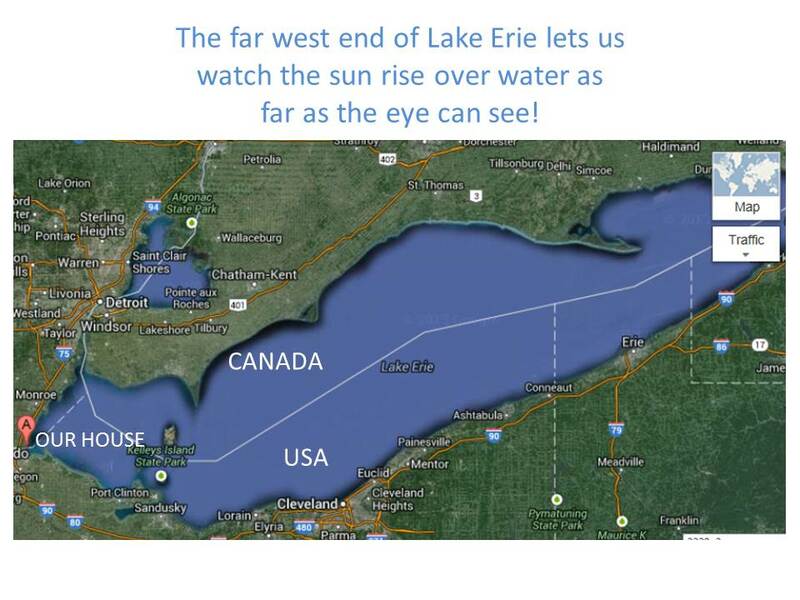 Rivers, lakes, creeks and harbors all flow together to make an inland waterway. 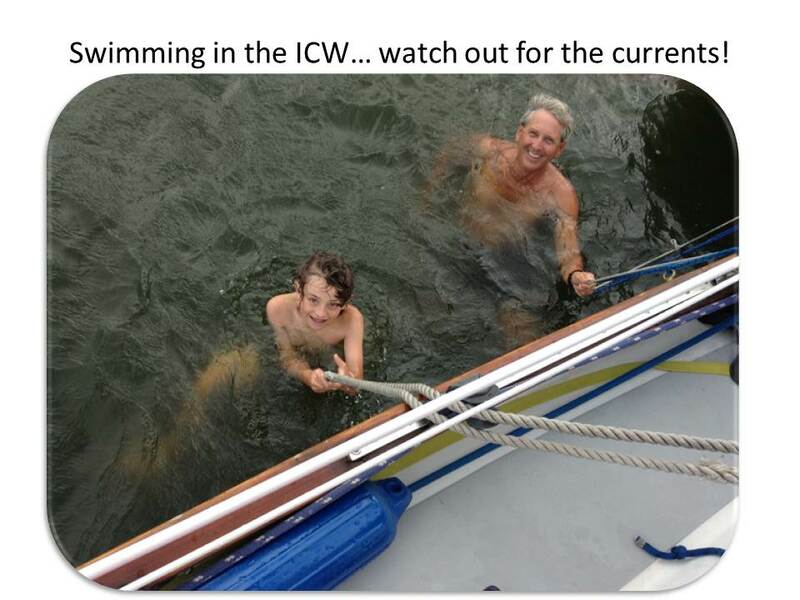 The US Government used to keep the controlling depth at 12 feet at low water but like other things the economy has hurt, the ICW is has not been maintained as it should be. Shoaling has occurred in many places and that can make for an exciting journey. We’ll have to deal with that as we head north. We have to use the ICW to visit some of the places on our journey so we’ll try to deal with low water levels and hope for the best. Although Tropical Storm Chantal broke apart she still caused us some nervous times. Weather conditions in the area were ripe for numerous thunderstorms and we saw a lot of them complete with lightning. Again our luck held as we dodged one storm after another. The most we had was light rain although places close to us had some horrific thunderstorms. Jack says he’s lucky for us and he may well be right. We spent two nights anchored in Lake Worth which a very well protected anchorage with relatively calm waters. 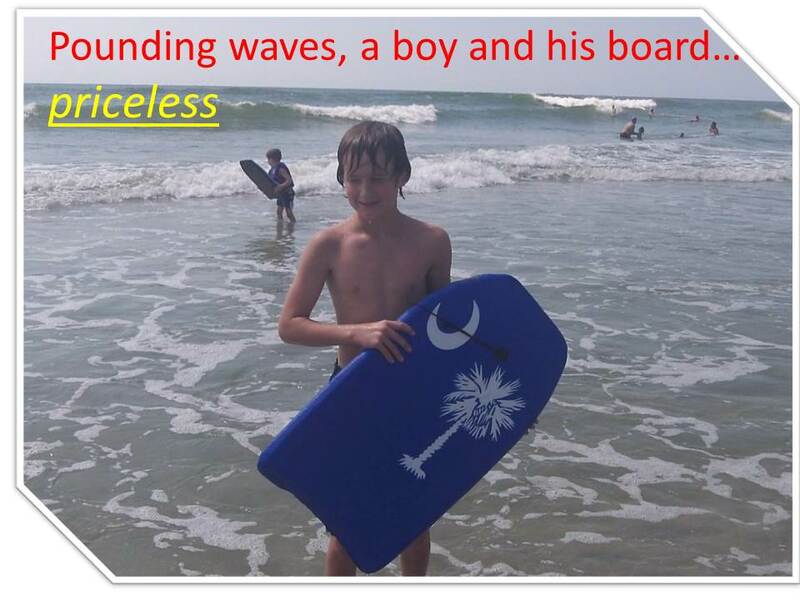 We put them to good use and got in some kayaking and Jack spent more time with his line in the water. 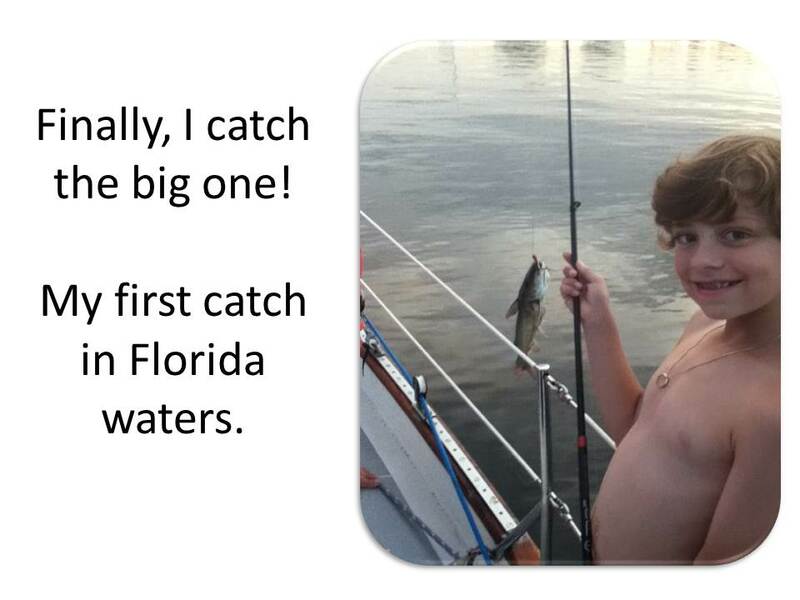 Finally, after countless hours of fishing, Jack caught his first fish in Florida waters. It was a catfish about 12 inches long and he put up a great fight. He was about the weight limit on Jacks’ line and his pole was bent almost in half before he got him reeled in. 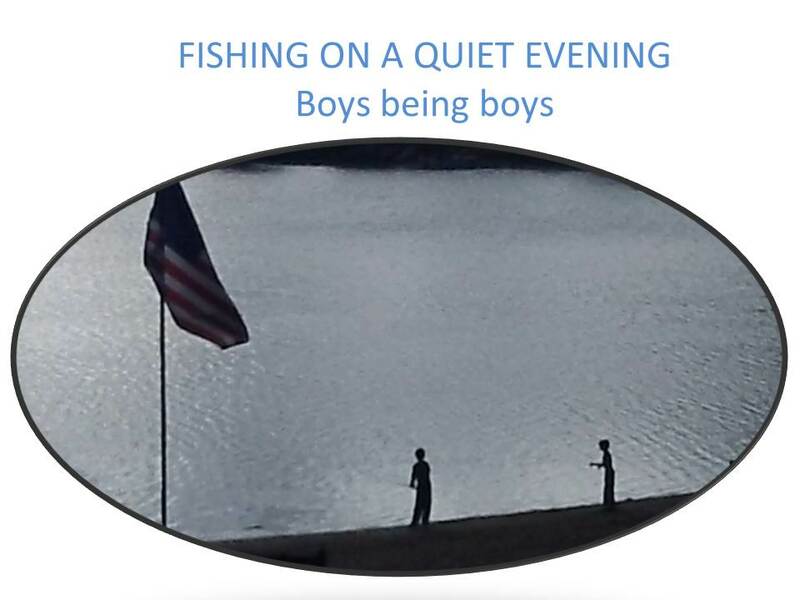 Not wanting to clean and cook catfish, I convinced Jack “catch and release” was the in thing to do. He agreed with the stipulation that we take a picture first! We’ve been cruising now for two weeks with crew member Jack and all I can say is “where was he on the first 5,500 miles of our journey”? 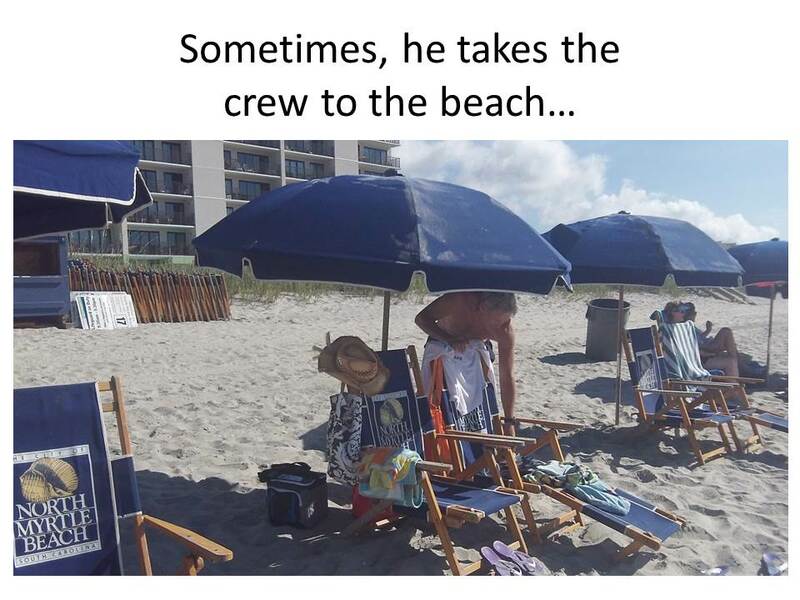 He loves being onboard and prefers the travel days over the staying in harbor days so he fits right in with the rest of the crew. We’ve been playing Scrabble, word games, learning to program and read the GPS, tying knots, learning a little Spanish and working on the “International Alphabet”. 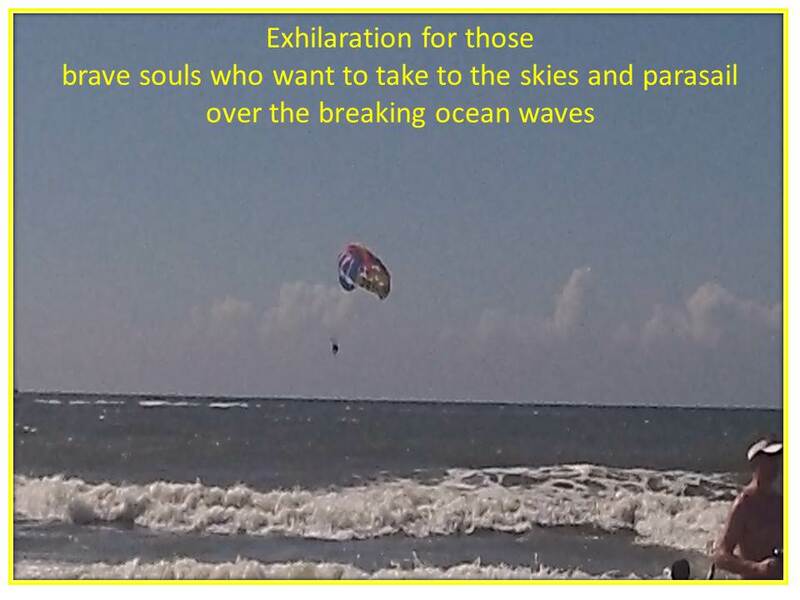 That’s Alfa, Bravo, Charlie, David, Echo to sailors and the military! Jack likes to think of it as “special code” that not everyone knows. 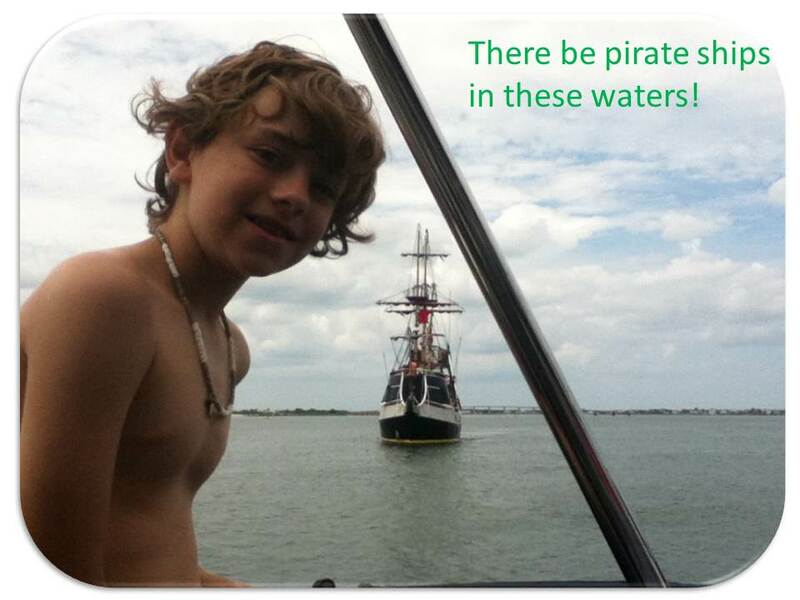 We left Lake Worth on Saturday, July 13th and for the next portion of our trip we will be traveling up the ICW. 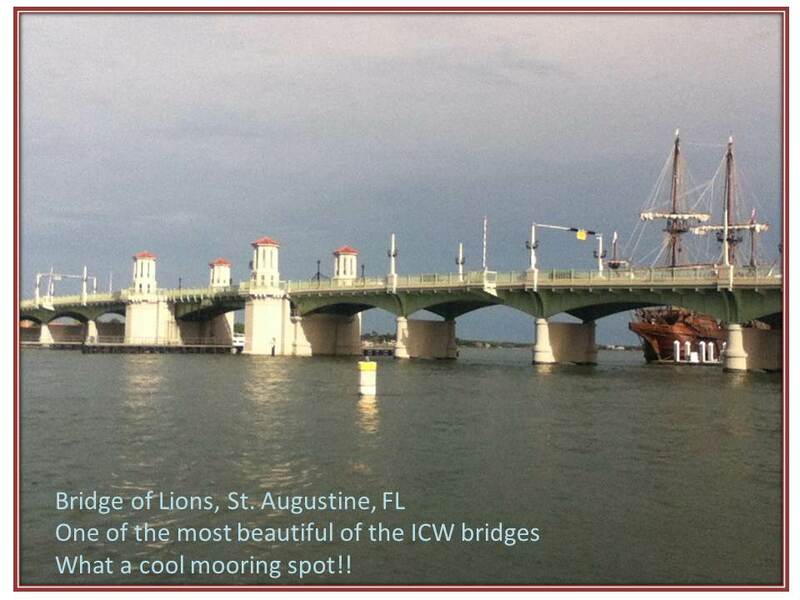 The ICW comes complete with an array of bridges and inlet and the next blog will cover our trip from Lake Worth to Vero Beach and beyond. Stay tuned for the further adventures of Tension Reliever does the ICW!!! I loved doing an overnighter. Sailing at night was great. Shining a flashlight on the waves made them so you could see them fold over while you were going through them. It was weird and pretty all in one. I really liked all the starts in the night sky and it was a lot of work watching for channel markers. I got to sleep in the cockpit and that was fun! Before we left my Grandpa and I had lots of work to do. At Lake Worth, I finally caught my first Florida fish. It was a catfish and was a lot work to reel him in. 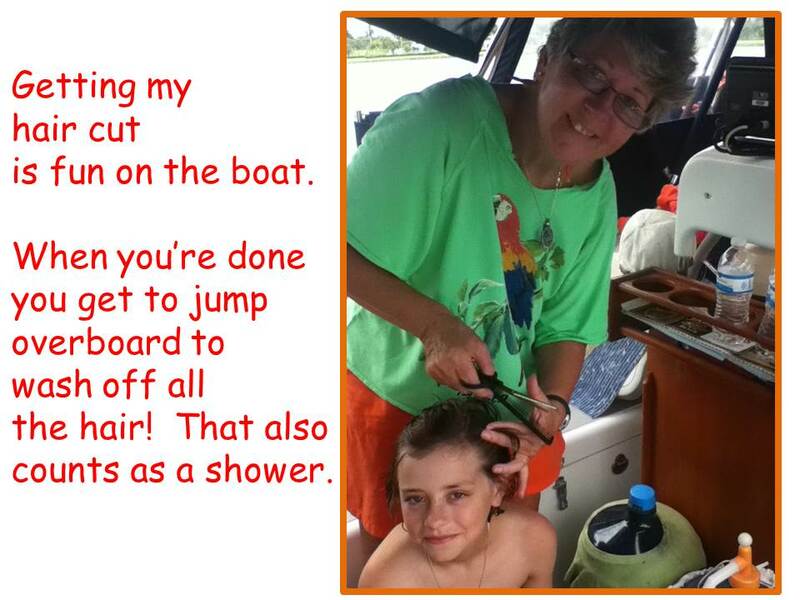 I went kayaking and raced my Grams in a race around Tension Reliever and to the buoy and back. 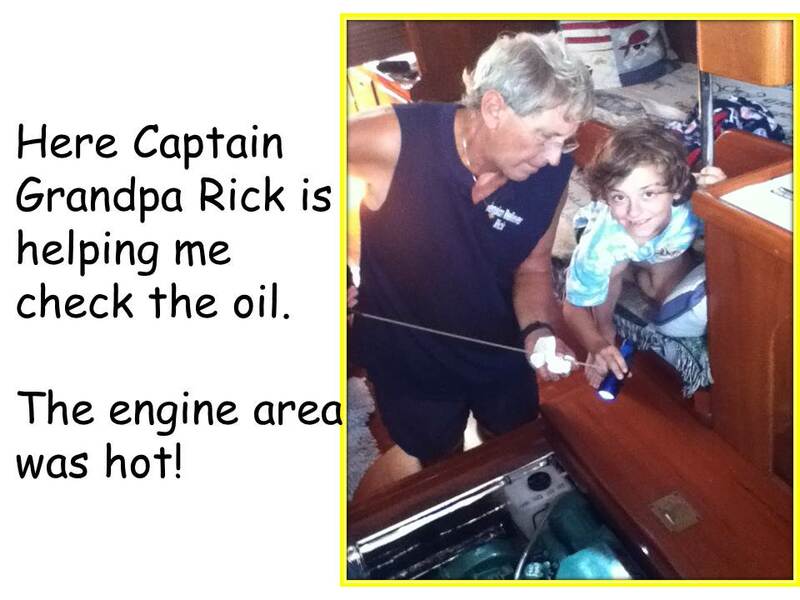 Then I went snorkeling with Grandpa Rick and hoped that my time in the water would count as a shower. Until my next blog…Learn secret code with someone you love!!! The crew of Tension Reliever is once again onboard. After spending about 5 1/2 weeks visiting family and friends in Ohio, the crew flew out of Detroit Metro Airport on Tuesday, July 2nd. 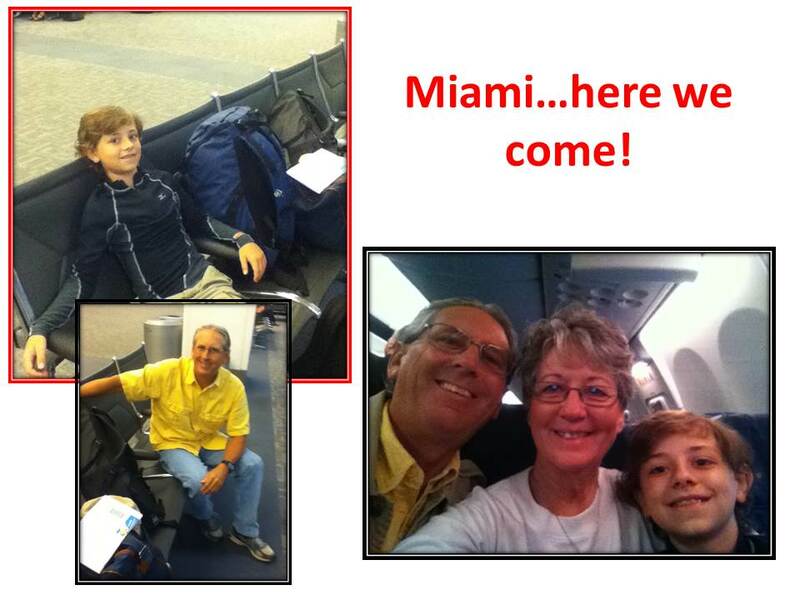 headed to Miami International Airport and then the Florida Keys. This adventure has a twist to it. The Captain and I were not alone on this leg of the journey. 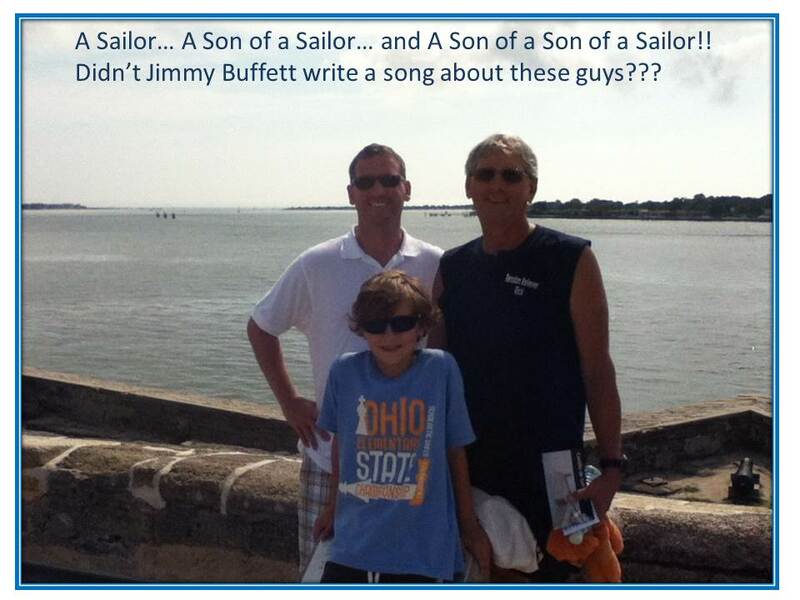 We were joined by one of our grandsons. His name is Jack and he is 9, almost 10, and he is definitely a great addition to the crew. Jack will be spending about 3 1/2 weeks with us and we hope to move further up the east coast of Florida while he’s onboard. We had a great trip back to the boat. 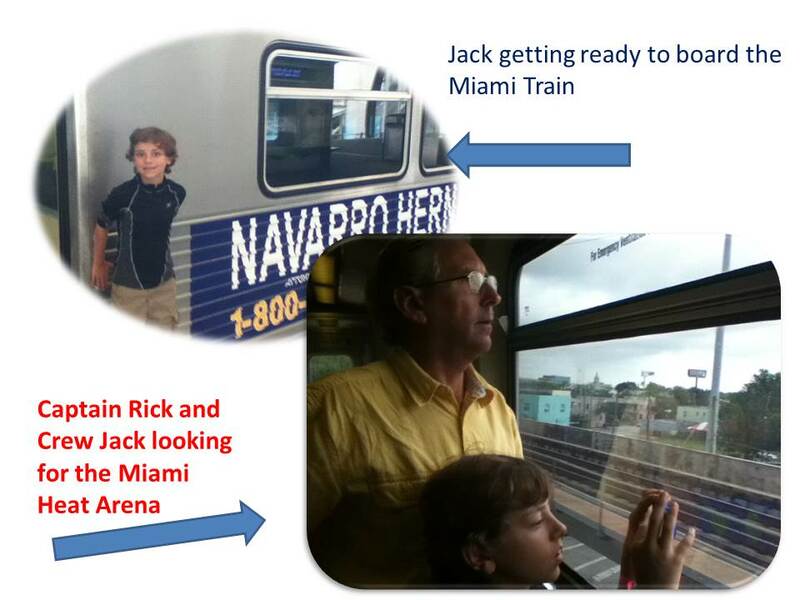 Our plane landed in Miami at 9:30 AM and we were soon on the Miami Dade Metro Rail and headed south. 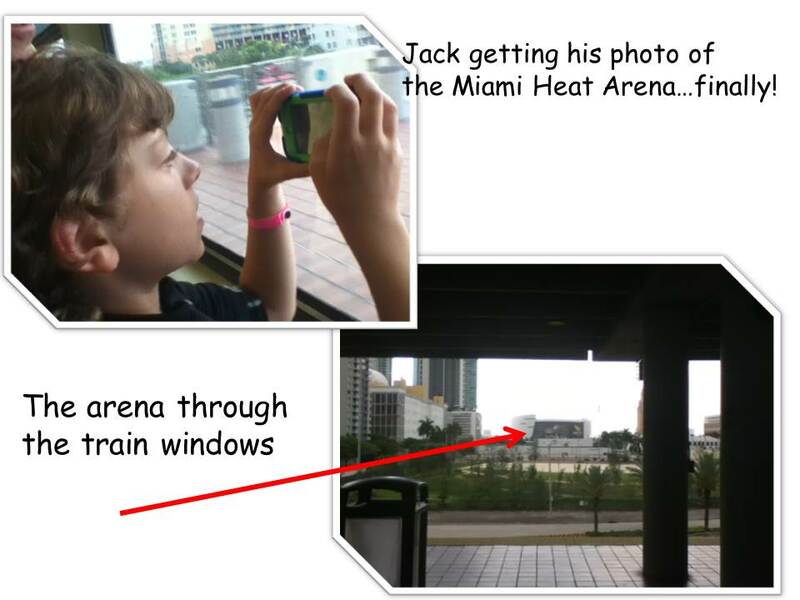 Jack is a Miami Heat Fan and he couldn’t wait to catch a glimpse of the Heat Arena as our train passed by. 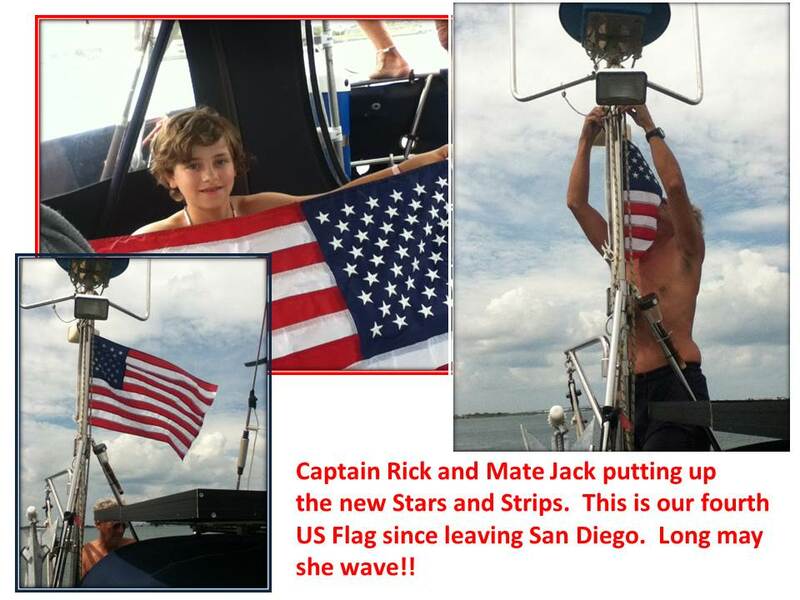 Captain Rick spotted it and Jack was ready to take his photo. He was excited and must have snapped about 12 pictures! The best one is included. The train led to a Miami Dade bus. We just missed our bus by about 1 minute and had to wait for another one. The next one was due in 15 minutes but when it came they took it out of service and sent it to the garage. That meant we had to wait at least another 15 minutes for the next bus. That normally wouldn’t be a problem BUT we were trying to catch the 1:00 PM bus in Florida City for our trip down the Keys. If we missed the 1:00 PM bus, the next one wouldn’t be thru until 2 1/2 hours later. We were counting the minutes as we buzzed down the busway and every red light seemed ready to seal our destiny. Minutes rushed past and our watches moved closer to 1:00. Finally, we could see the bus stop at the Walmart and the 1:00 bus was still sitting there. My watch read 12:59. 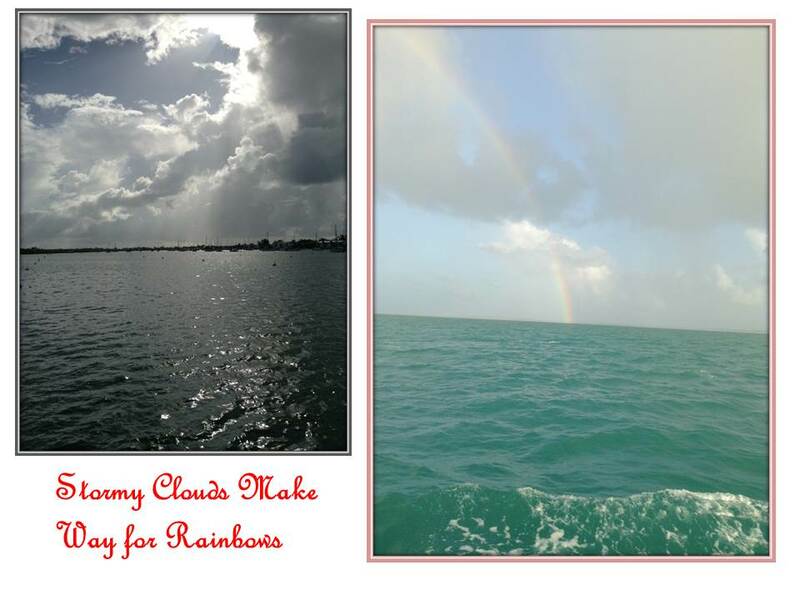 We hurried from the Miami bus and climbed aboard the bus to the Keys. I asked the driver if we had time to hit the restroom first but he said “Nope, we should already be out of here.”. Okay then, next stop Marathon Florida. We didn’t even have all our luggage settled in before he shifted gears and headed south. We felt lucky and we passed high fives all around!! We arrived in Marathon and headed to the nearby McDonalds. It’s a good thing it was close to the bus stop because no sooner did we get into the restaurant than the heavens opened and the rain came down in torrents. We settled in, ate our fill and then called a taxi to take us to the motel. Believe me, it felt good to crawl between the sheets after a long day of traveling. 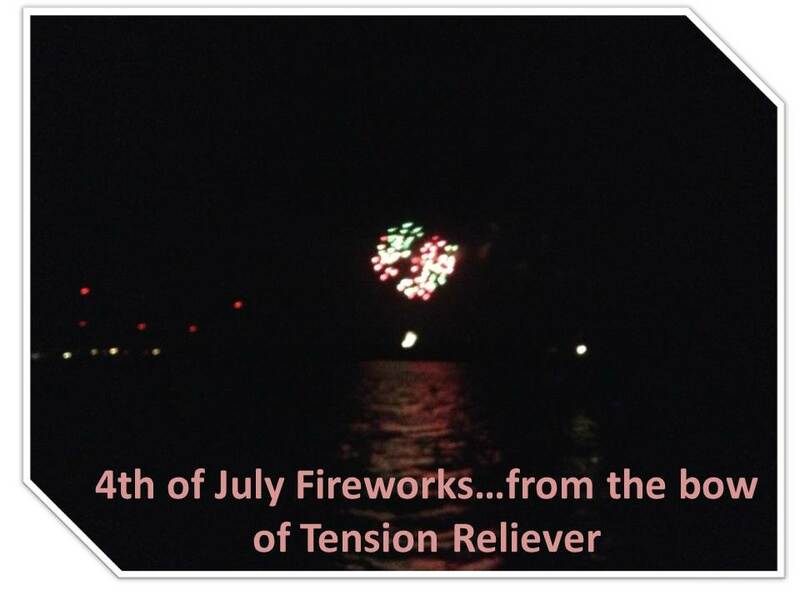 Wed. July 2nd, we were up early and excited to cross the street to the Marathon Boat Yard and watch as Tension Reliever was “splashed” back into the water. Rick had walked over the night before and checked out the bottom job and he gave it “thumbs up”. We were good to go. We arrived at 9:00 AM and were told they had her ready and we should go on back. I stayed in the office to take care of paperwork and then I headed out to meet the guys. Captain Rick and Jack were standing by the boat and I could tell by the looks on their faces that something wasn’t good. 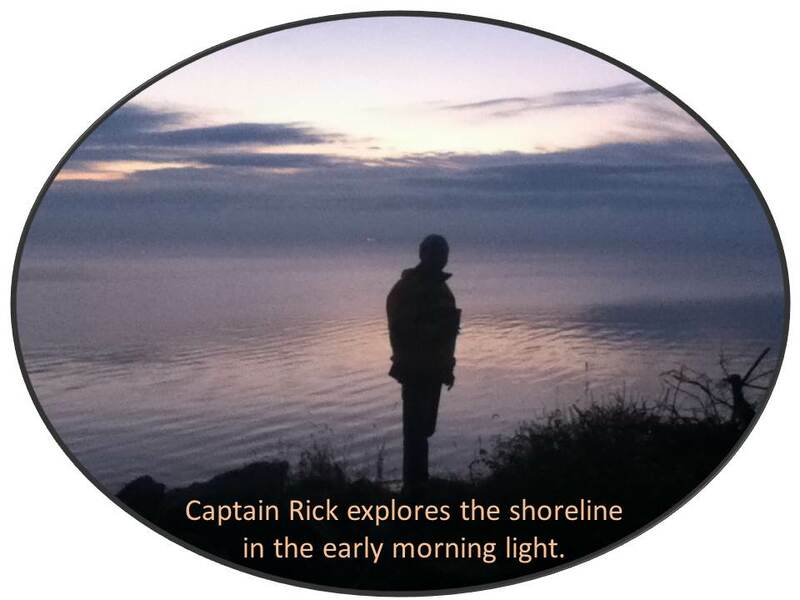 As Captain Rick walked towards me, my heart was in my throat. Tension Reliever is not just our boat but she is our home and having anything go wrong feels very personal. Turns out when they put the slings on (the straps that hold her while they lift her), they put them a little behind the “sling here” signs and then the straps angled more toward the rear of the boat. 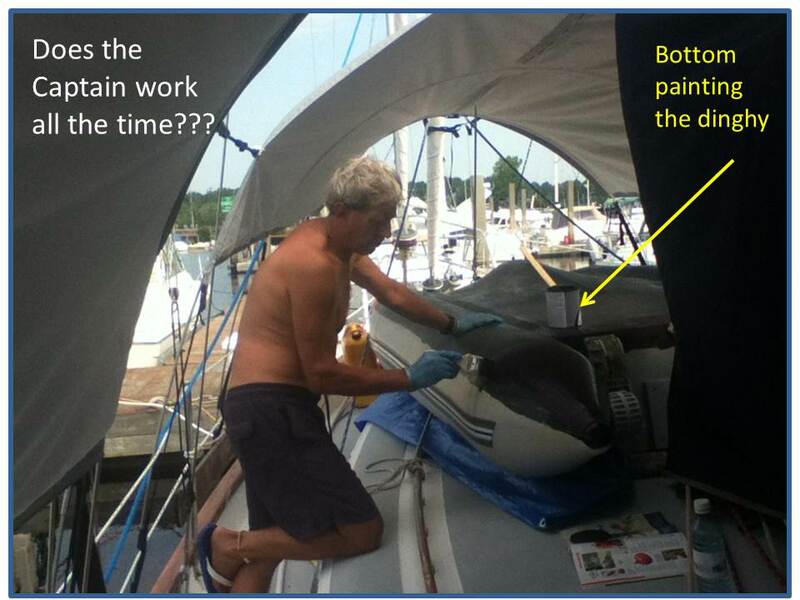 The very back of our keel was foamed in and it doesn’t have real support there. When they had lifted it, the weight crushed the foam and it split open like a ripe melon. Captain Rick walked over to talk to the yard manager and I tried to quell the sick feeling in the pit of my stomach. 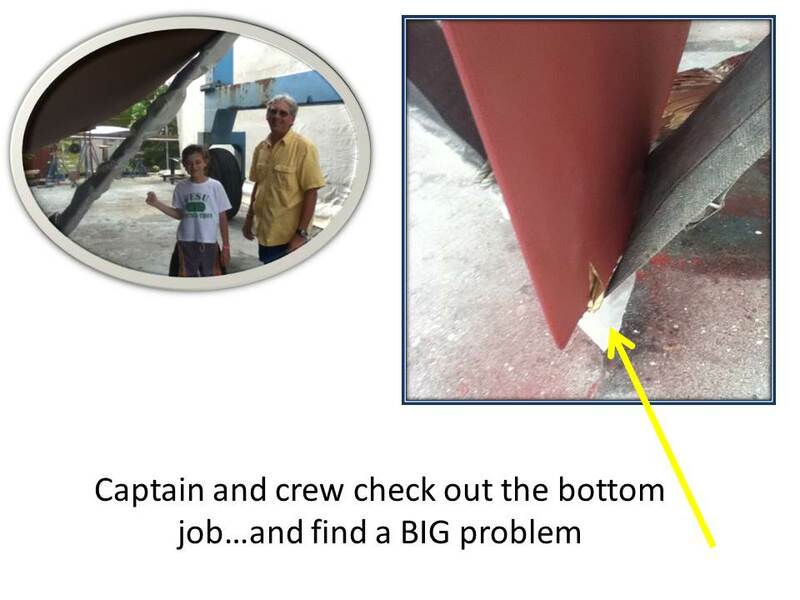 Long story short, the Marathon Boat Yard took full responsibility for the damage. They said they would fiberglass the area then repaint it and they would have her ready to launch by close of day. The Captain talked to the “Man in charge” and he hated that it happened by he guaranteed his guys would fix it and it would be better than the original. They also called our motel and got us a room for that day and night. We were heartsick but there wasn’t much we could do except rely on them to do their best and get us in later that day. 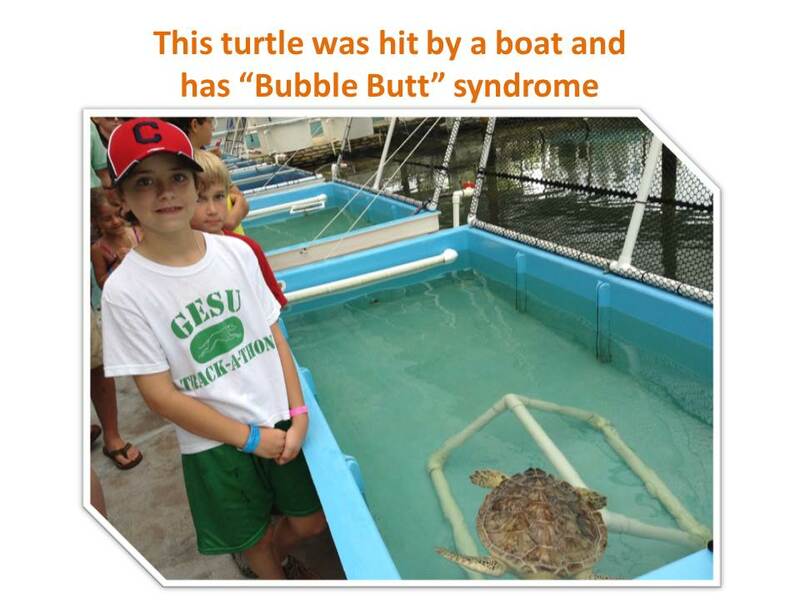 Jack and I decided to make lemonade out of lemons so we spent the day at the Turtle Hospital. Captain Rick checked on the boat a few times during the day and then about 4:00 PM they called and said they were ready to launch. We once again headed across A1A and checked out our boat. She looked good! 🙂 They had done a bang up job (no pun intended) and we were good to go. As soon as she was wet, I took the “Company” pickup truck and made a trip to the grocery. 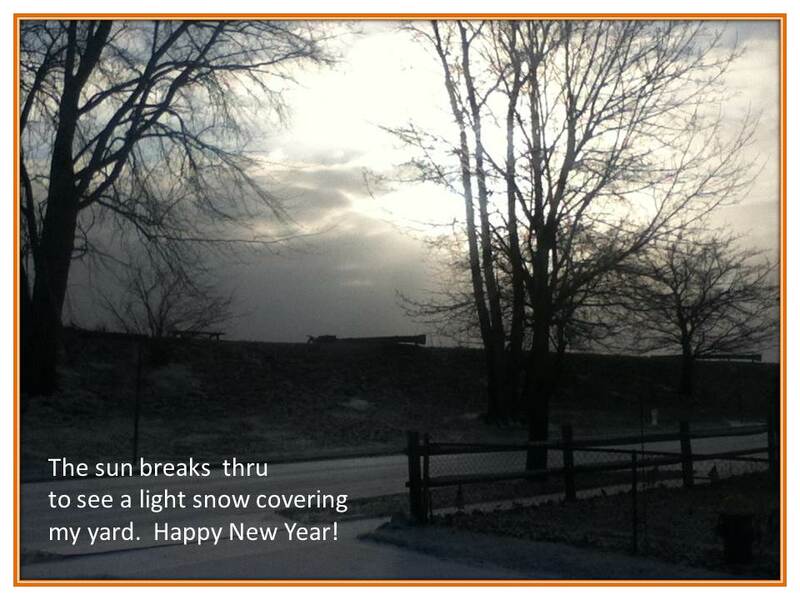 That saved us a walk of several miles carrying a load of groceries. We could have spent the night on the boat but there was a lot of work to do so we slept in our “free room” at the motel and on Friday morning we finished getting her ready to go to the mooring ball. 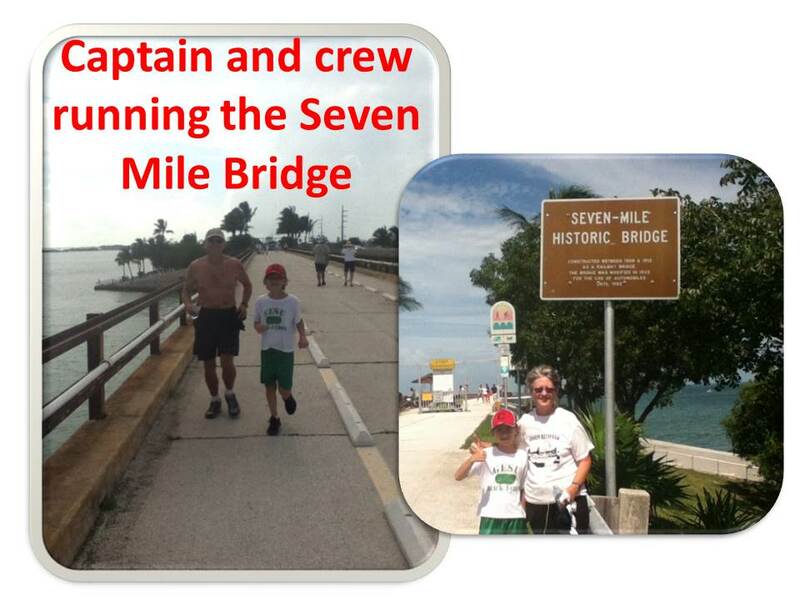 BUT, before we left the Marathon Boat Yard, we walked about a mile and a half and ran the Seven Mile Bridge. 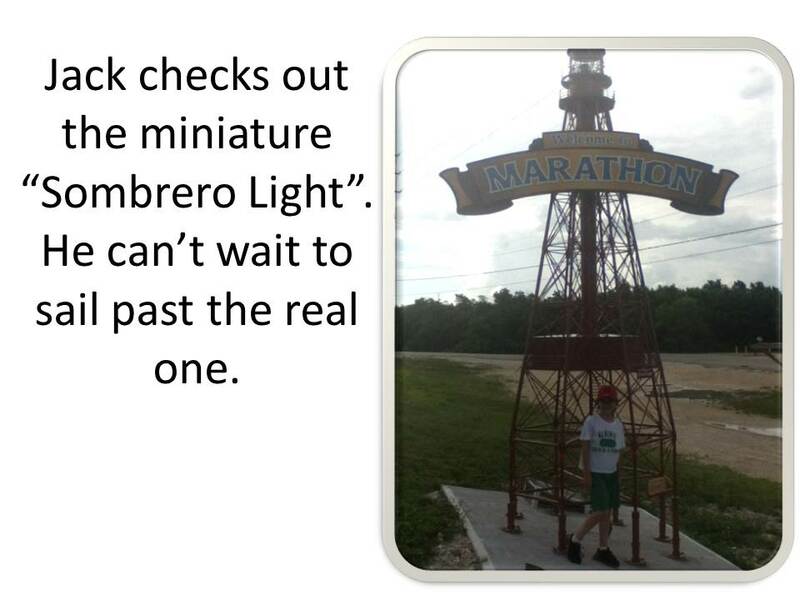 Jack had been looking forward to this and we were excited to share it with him. Rain clouds threatened as we walked down A1A headed for the Seven Mile Bridge. 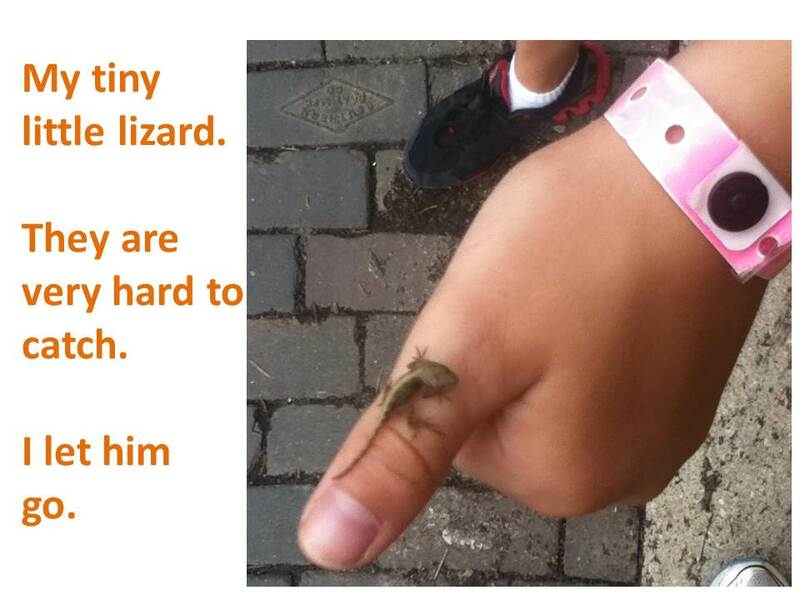 Jack was busy trying to walk and spot lizards and crabs. He saw lots of both but he wasn’t fast enough to catch anything. 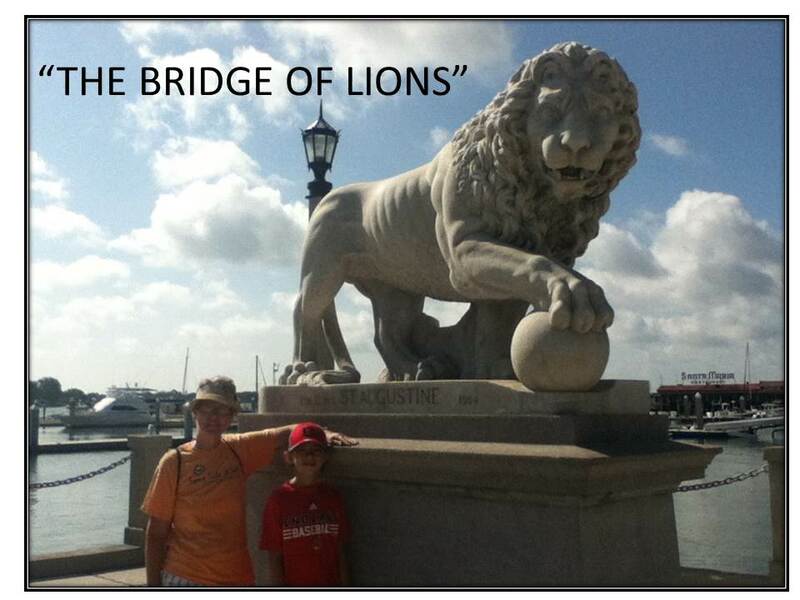 THE GOOD was running the bridge with our grandson. THE BAD was the condition of the surface of the bridge. It’s blacktop with lots of cracks and eruptions, otherwise known as speed bumps to runners! 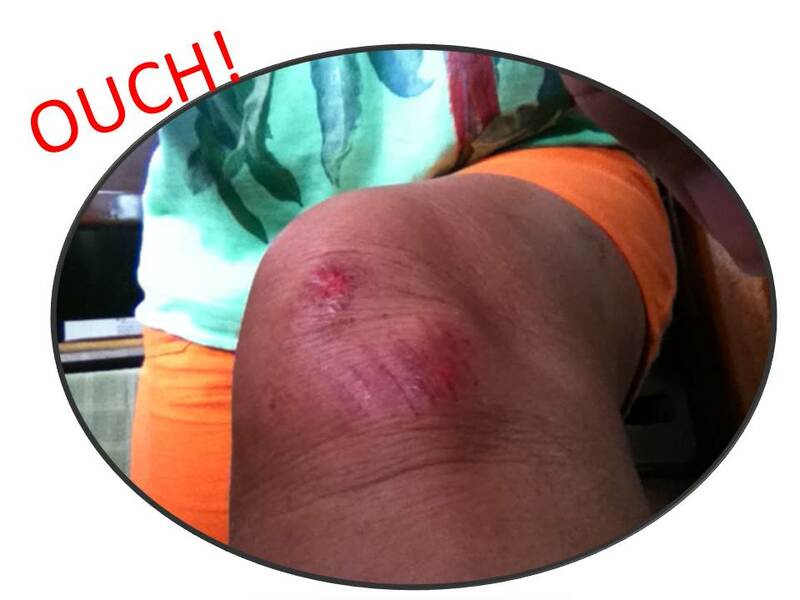 THE UGLY is how my knees looked after I tripped over one of the eruptions and landed on both knees, both hands and one elbow. Luckily I carry a hanky with me so I had something to sop up the blood. Captain Rick and Jack were running ahead of me and they didn’t notice my falling until they looked back and saw me sitting on the ground and then slowly getting up. I got up, nothing appeared broken, and started running slowly toward them. The last thing I wanted was to stiffen up and not be able to run/walk back to the boat. The Captain and Jack had a good time at my expense (after they made sure I was okay). 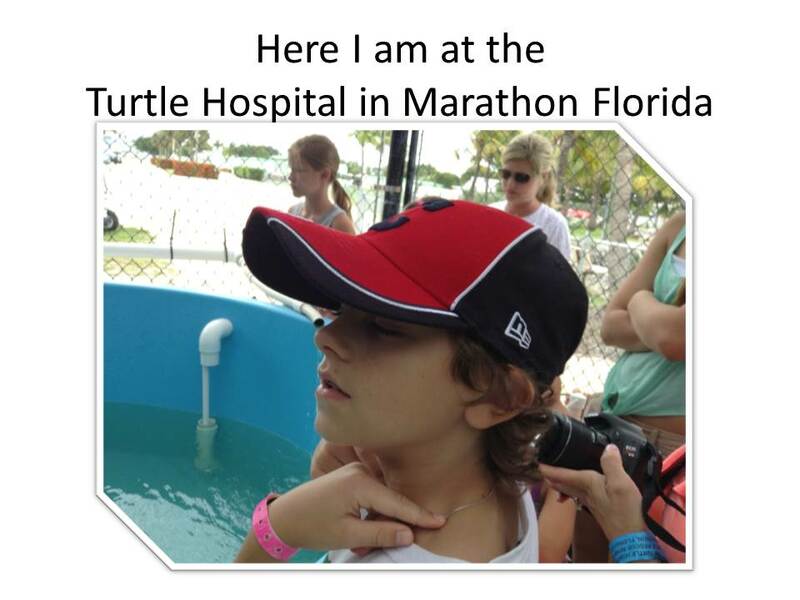 Jack thought if I needed a doctor they could take me to the “Turtle Hospital”. I said “A turtle doctor, I’m not a turtle.” I’d played right into his hand as he grinned and said “No, but you run as slow as a turtle.” I thought this was a very good time to remind him that I’m the one who cooks his meals for the 3 weeks and he conceded and “Sorry, Grams.” but he was still grinning like a banshee!! We’ve spent a few days exploring Marathon with Jack. 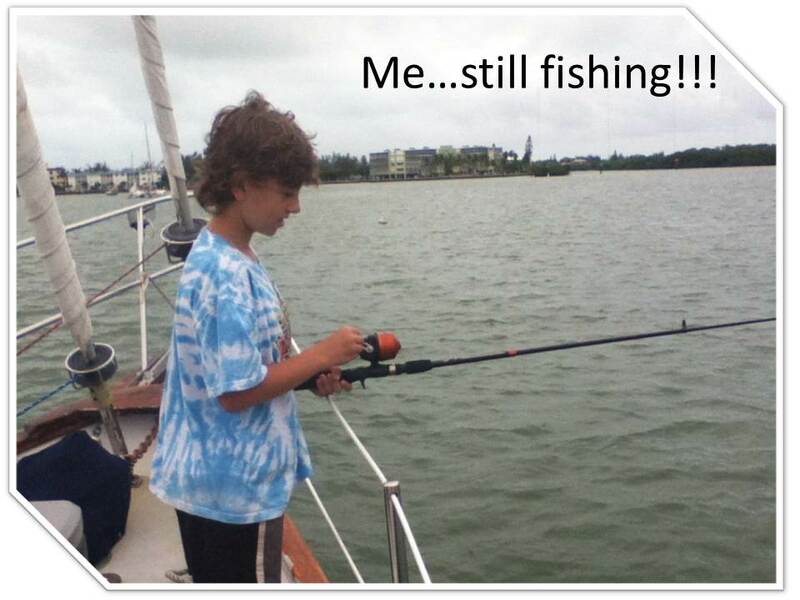 His main wish was for fishing and he’s been busy trying to catch “anything”. No luck so far. We’ve tried the bow of the boat and we even took the dinghy into the mangroves but still no luck. 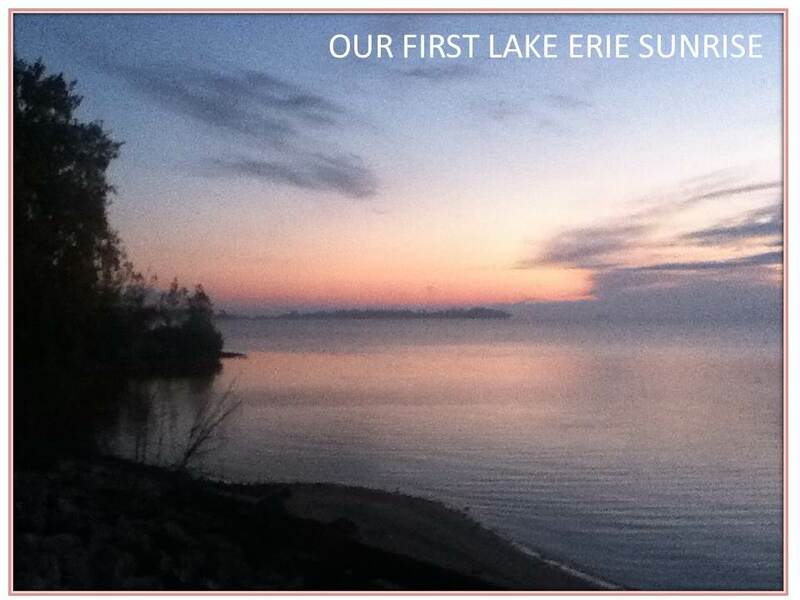 No fish but we saw lots of birds and enjoyed a beautiful morning on the water. It’s been a unique experience having a crew member aboard. 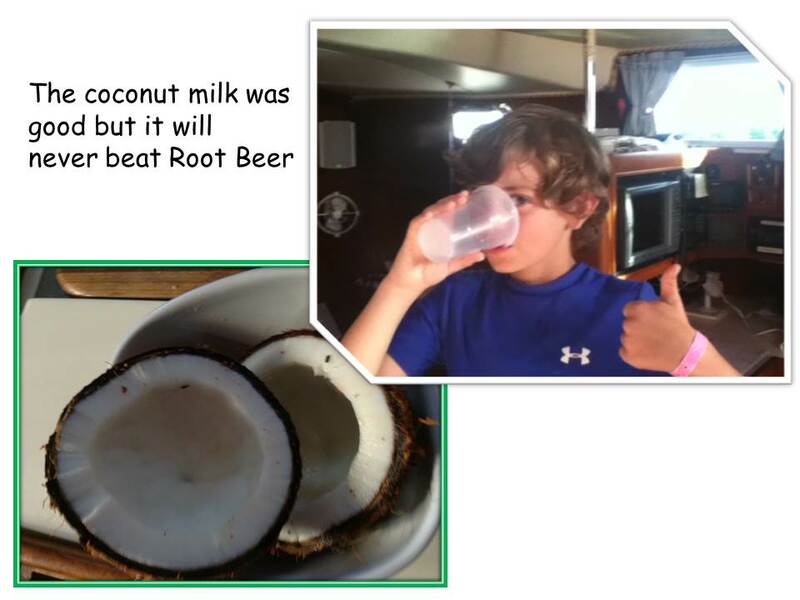 After 5 days aboard, I asked Jack what was the best and what was the worst. 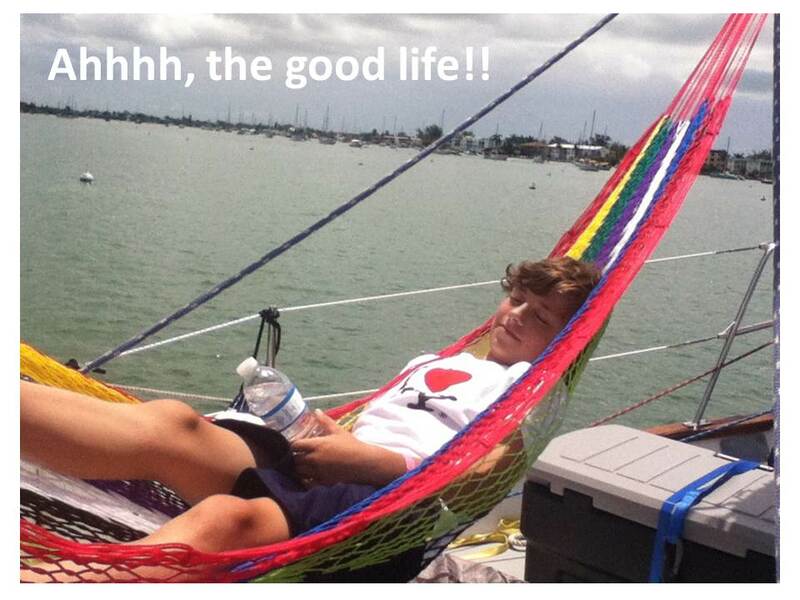 He said “It’s all been great!” So I guess lugging groceries and luggage and cleaning the boat and getting her ready to sail seems like an adventure to a little 9 year old boy. 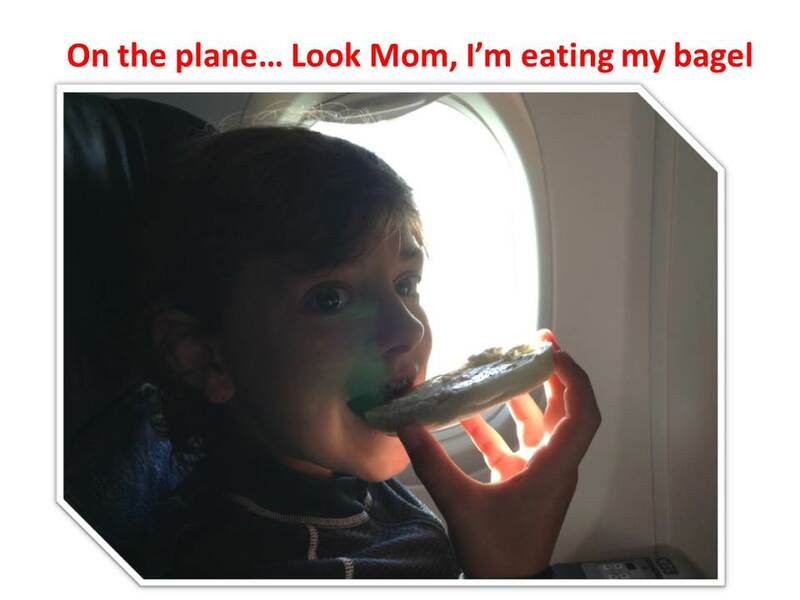 Funny, it seems that way to his Grandma Rose too!!! We are packed and ready to take off tomorrow morning. 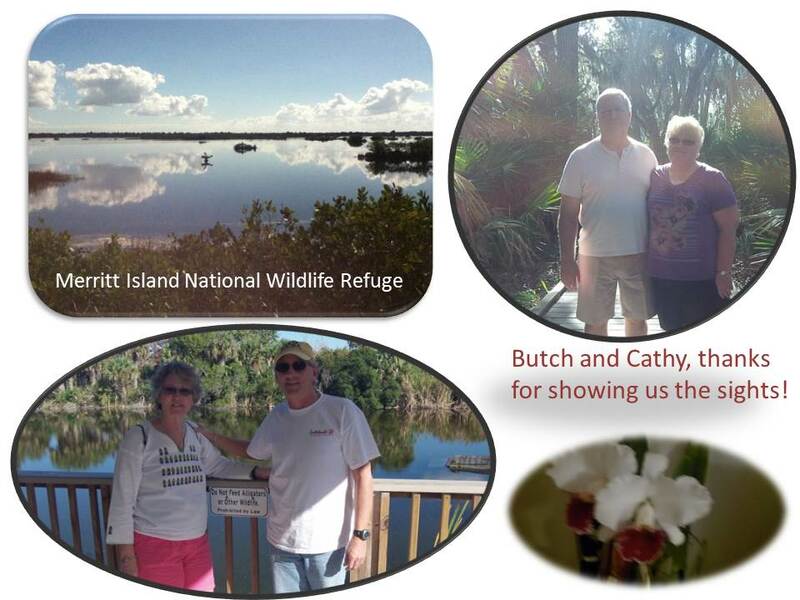 We’re heading north along the Florida coast and will keep you posted on where we go and what we experience. 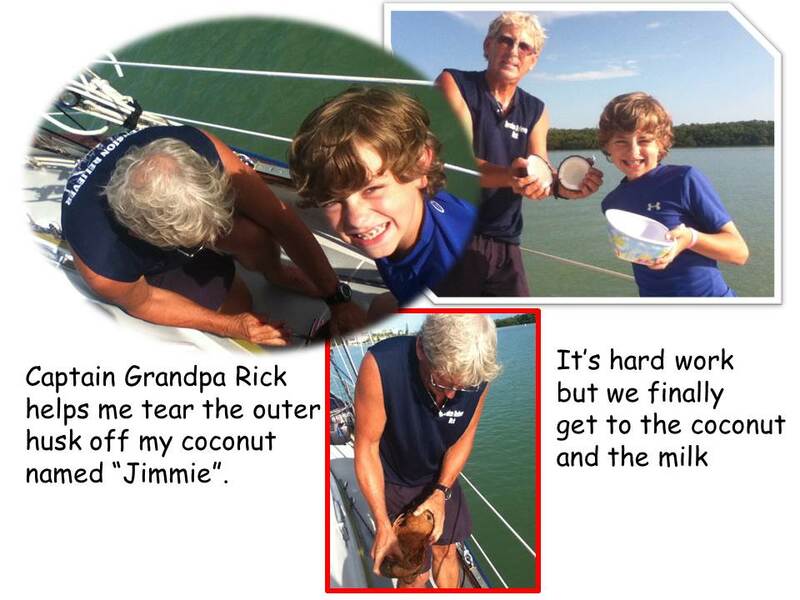 My name is Jack and I’m having FUN sailing with Captain Rick (Grandpa) and Grandma Rose. 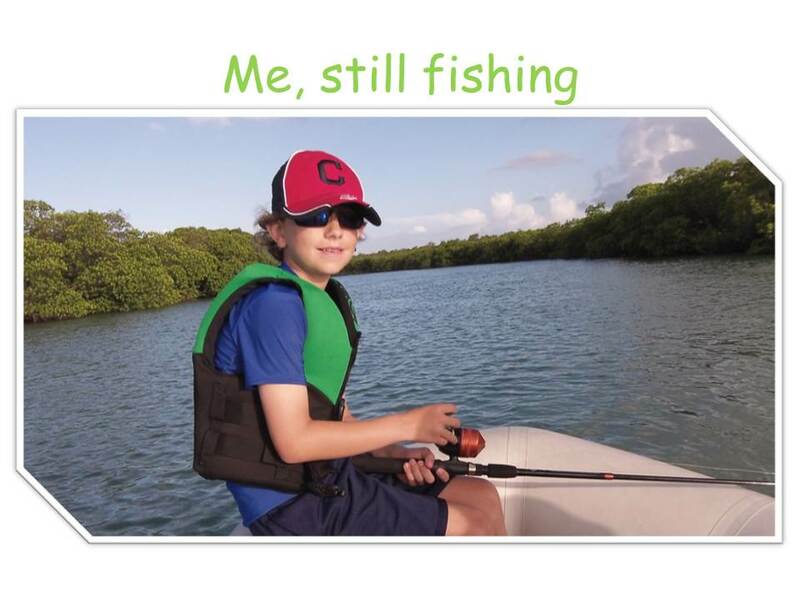 I really like fishing and driving the dinghy. The Keys have lots of turtles, lizards and crabs and I’ve been chasing them all!! 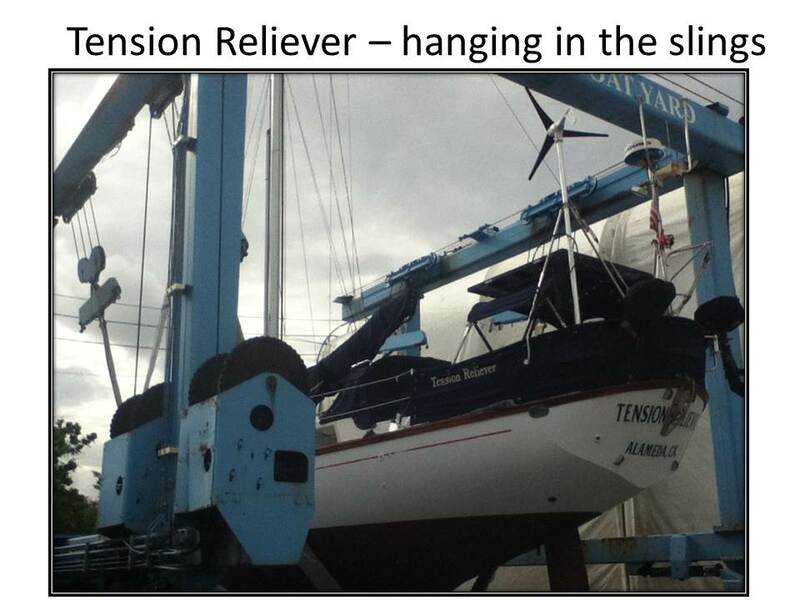 I like the name of the boat, Tension Reliever, it’s awesome. Lots of times, it gets my tension out. We have been watching movies and I have a really cool bed called “The Pilot Berth”. Tomorrow I Sail, and I’m really excited to sail to new places and I hope I get to do an overnight sail. It was great visiting with family and friends but it has been great to again be aboard our home “Tension Reliever”. Feeling the water lap against the hull as we drift off to sleep is magical and always makes me smile. Tomorrow we begin a new journey up the coast and we are all hyped and ready to go. Wonder if we’ll get any sleep tonight? Until my next post…I wish for you…magical times of love and laughter!